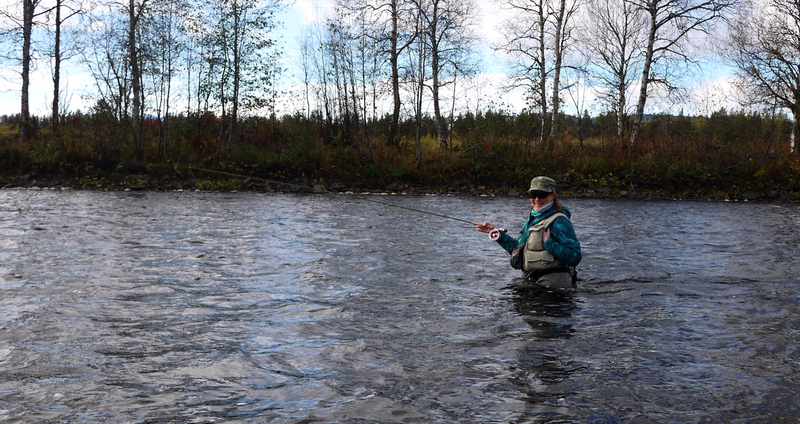 Maybe one of the last fishing days in the season. 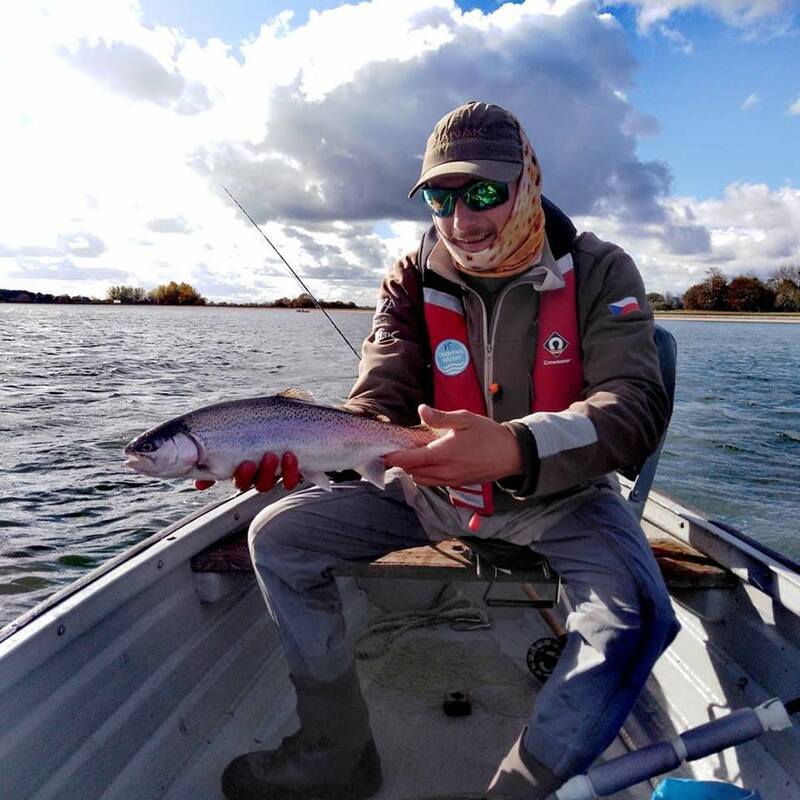 After few outings of pike fishing with big streamers, I was missing light nymphing with my new Hanák superlight rod, and also looking forward to test new colours of beads. 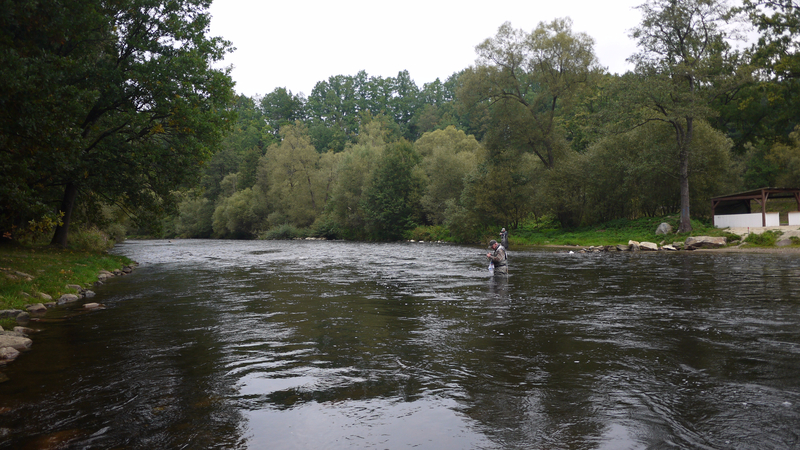 Nice weather was irresistible, so I went to Vltava river close to Český Krumlov, at first I caught few graylings in the town, it was good message, that grayling is able to survive and to growth after stocking. 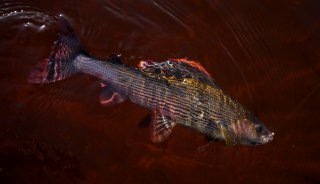 We stock them regularly in the age of one year and size of about 15 cm inside of the town, where they are sheltered against cormorants. 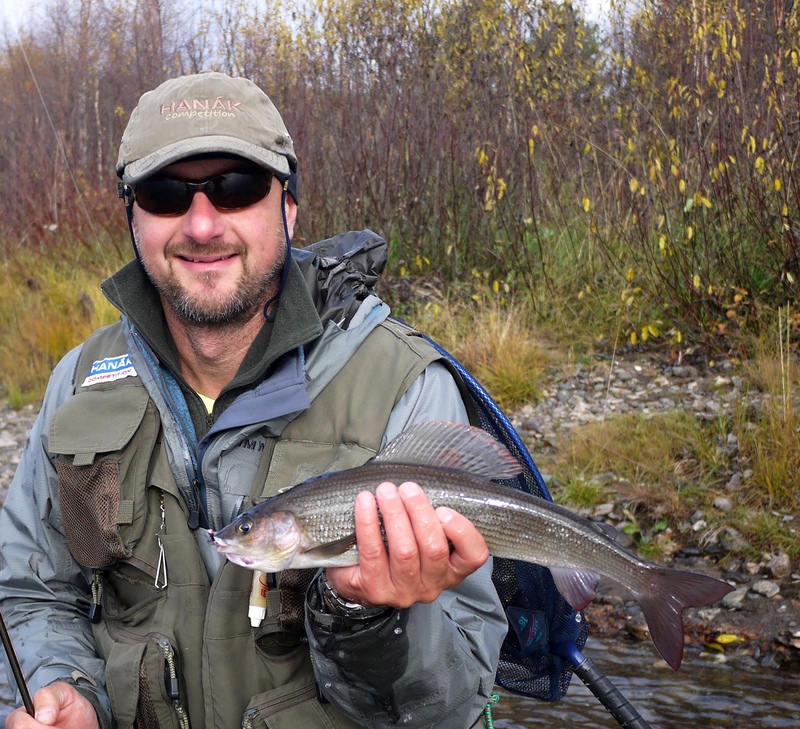 Next I moved a little upstream and caught few browns, chub and also about 20 rainbows. 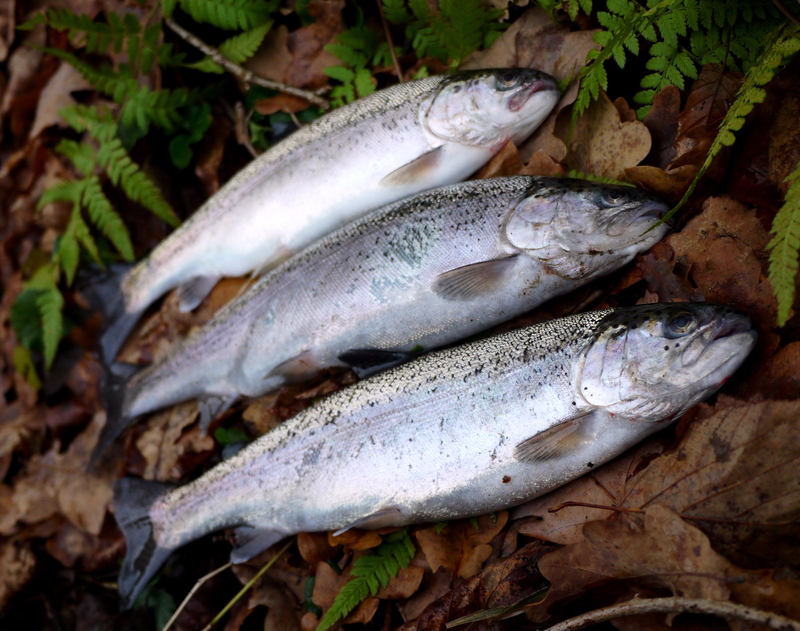 Not monsters, but nice fish in good condition, three of them I took home and made dinner for our family. 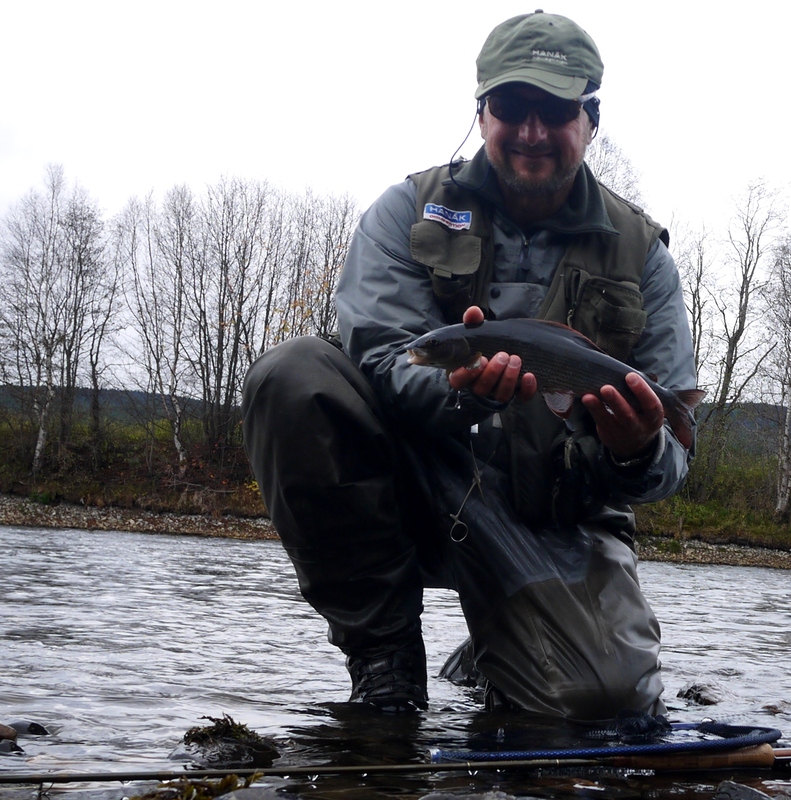 The bad luck was, that I lost my fly box with jig nymphs somewhere during first day, but I took it not as a tragedy, but as a great chance for upgrade I´m looking for long winter evenings at vice. 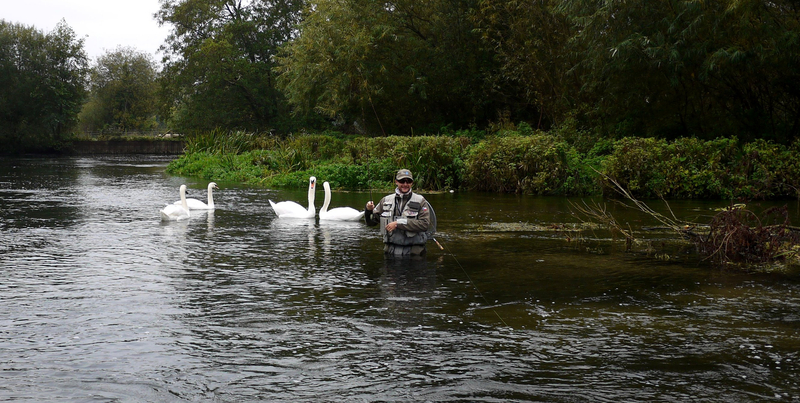 We decided to check our favourite river in the end of August, whether the graylings are already active. 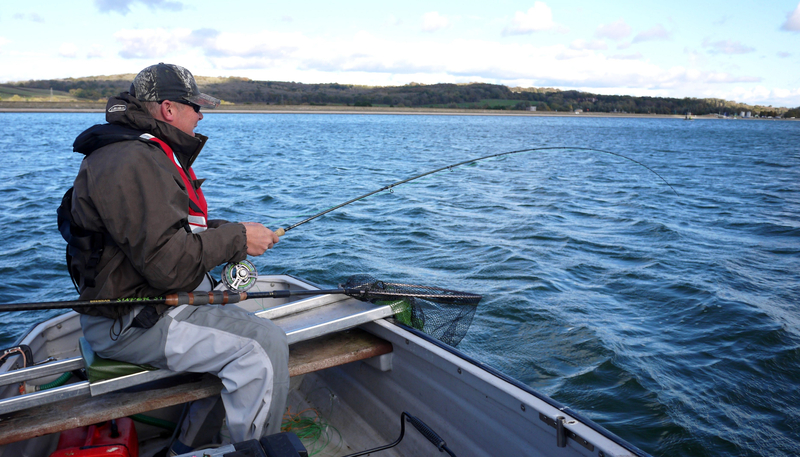 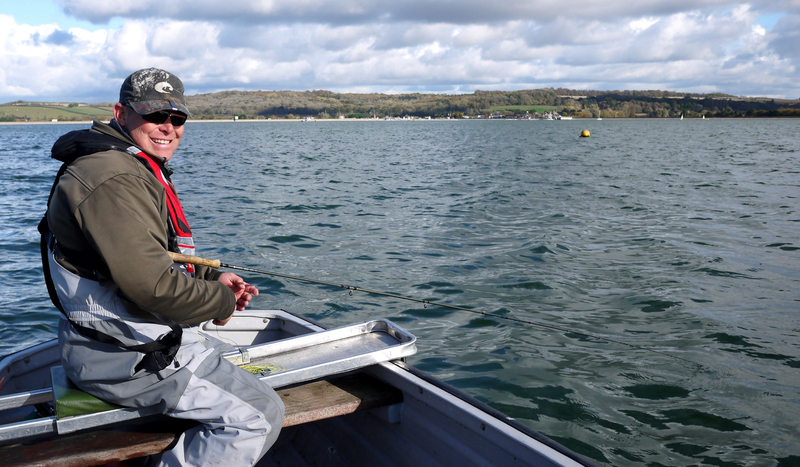 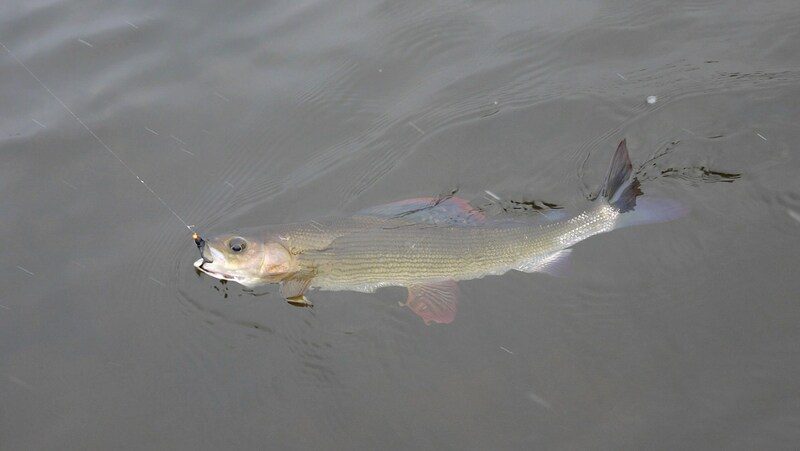 We caught many coarse fish, mainly bleak, roach, dace, also perch. But we caught also few nice graylings mainly on nymph. 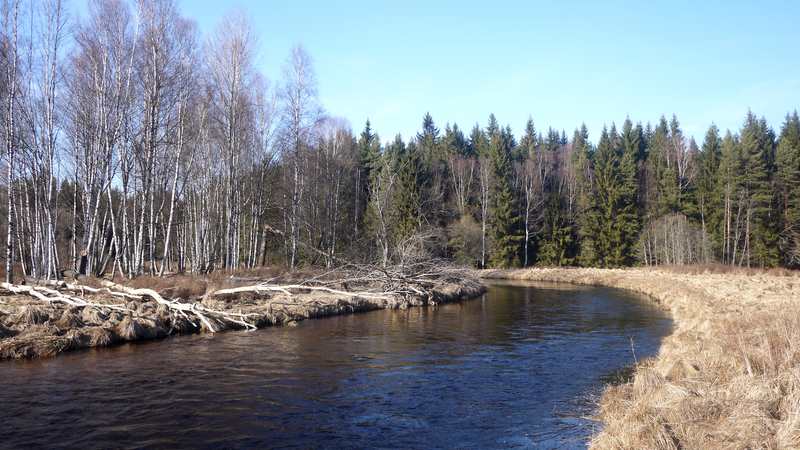 In a nice place, I noticed four good graylings staying along an edge about 2 meters downstream from me. 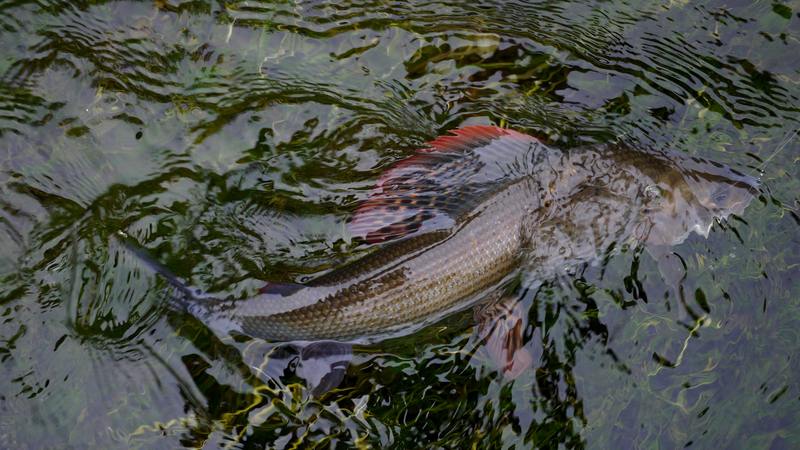 So i sent them my favourite nymphs and … nothing happened. 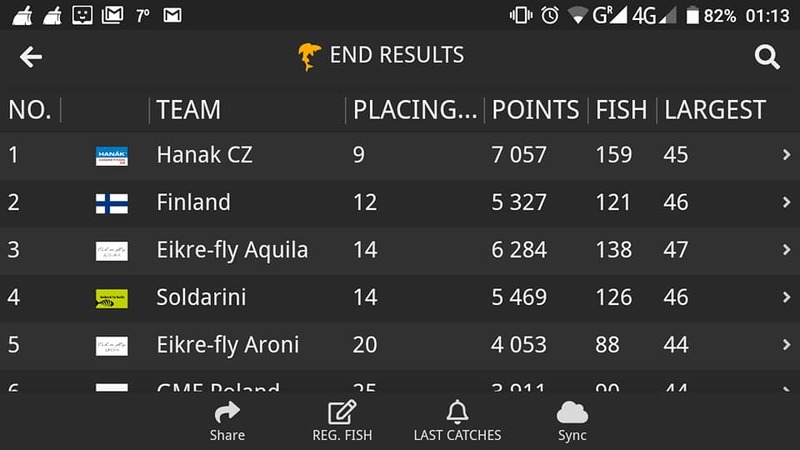 So I changed flies and … again nothing. 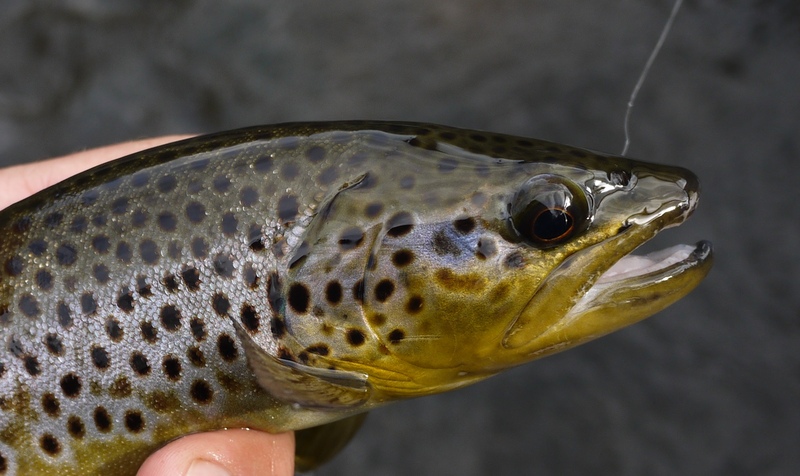 I tested about 10 patterns and also dries, but I could see not any interest. 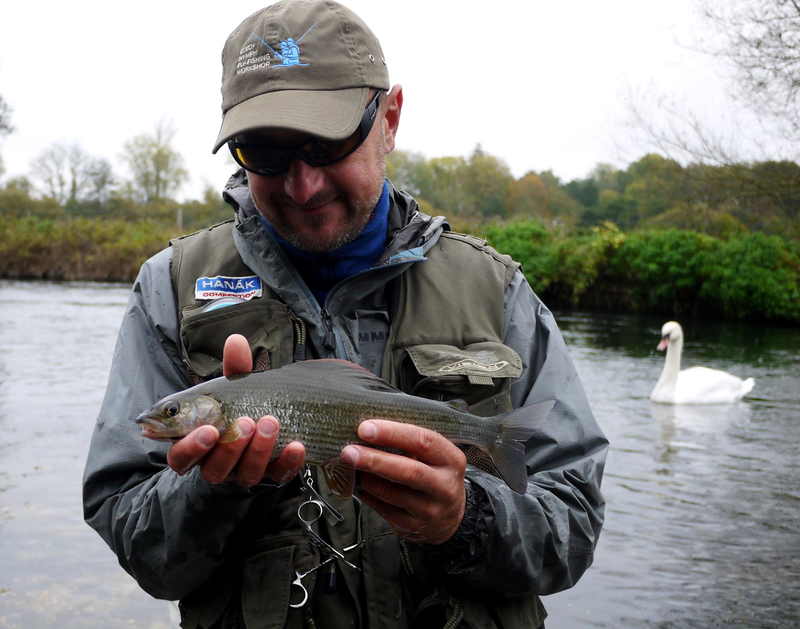 As the last chance, I took from my fly box a pink squirmy worm, when it fell to water, all graylings became nervous, but, out of the blue, appeared a perch and took the worm just in front of the nose of the first grayling…. 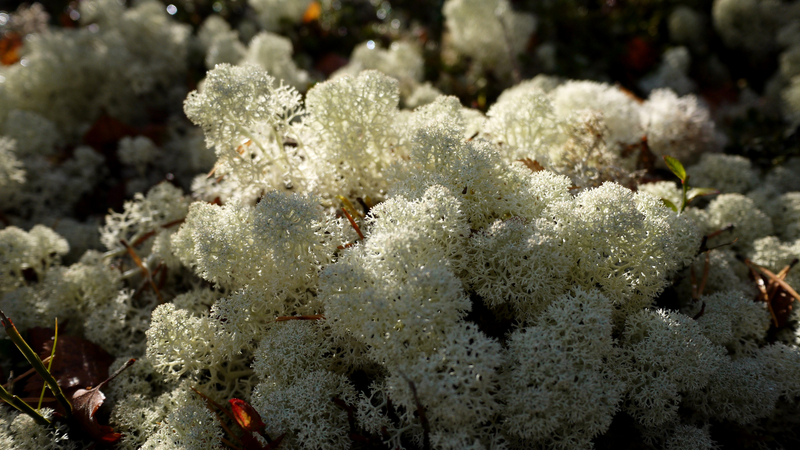 The faith disturbed the graylings and they moved away. 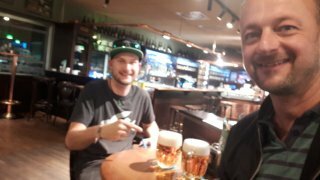 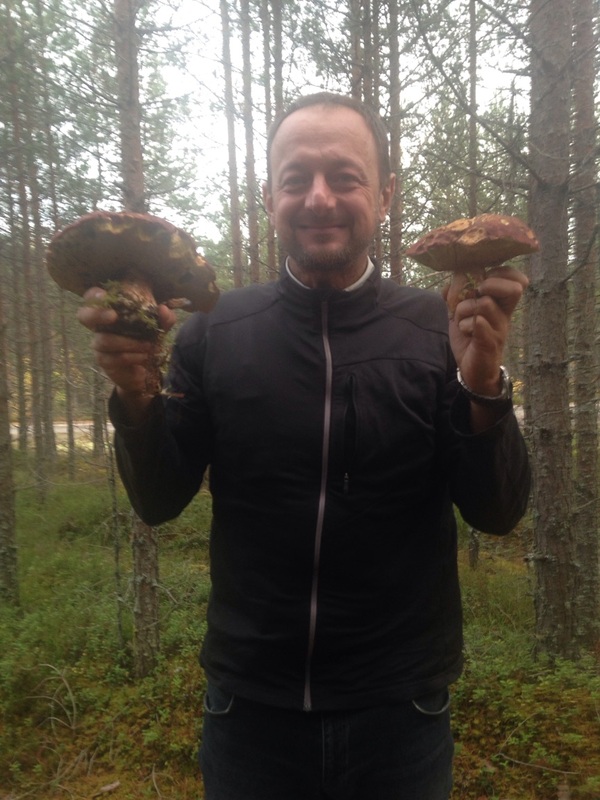 On the way back to car I saw couple of deer, found some mushrooms, and we also did not forget to go for dinner to the restaurant “U Grobiána” in Lenora. 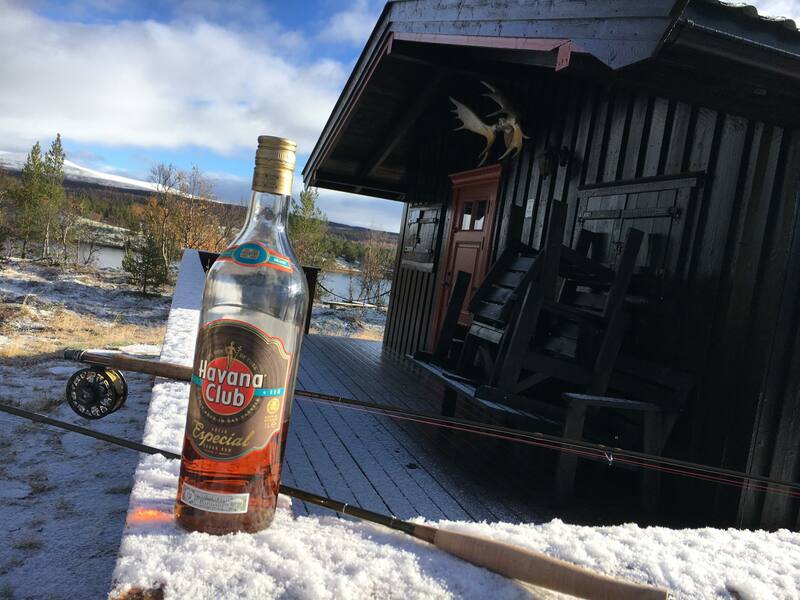 Simply perfect afternoon. 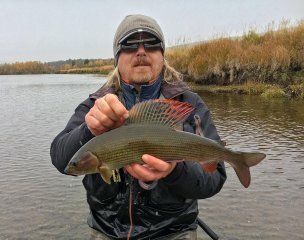 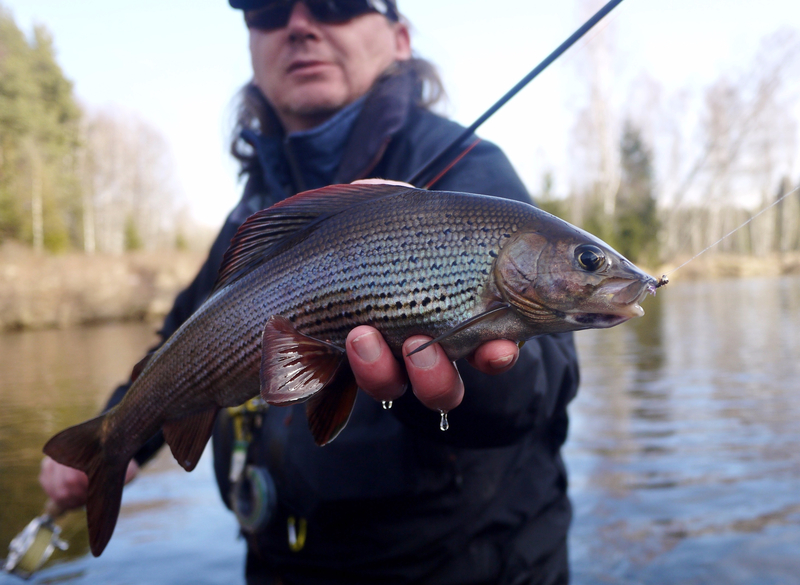 I love fishing for grayling in the end of winter, Honza and I never miss opportunity to visit lower part of Warm Vltava which is open for fishing also in winter. 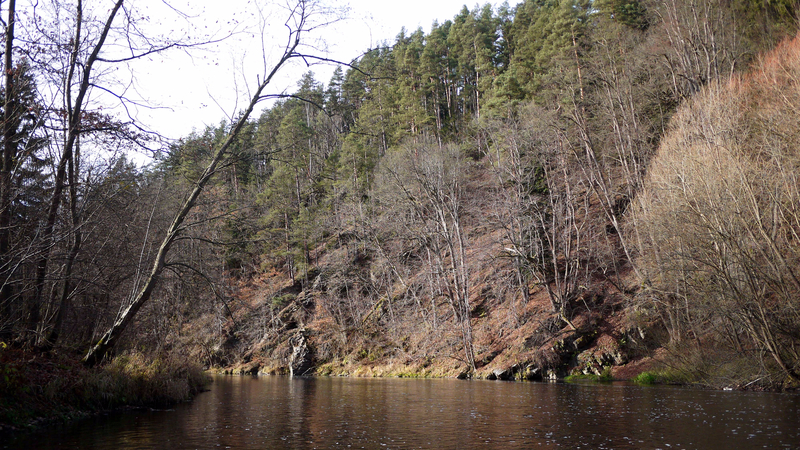 Vltava has three sources, Warm Vltava, Grassy Vltava and Cold Vltava. 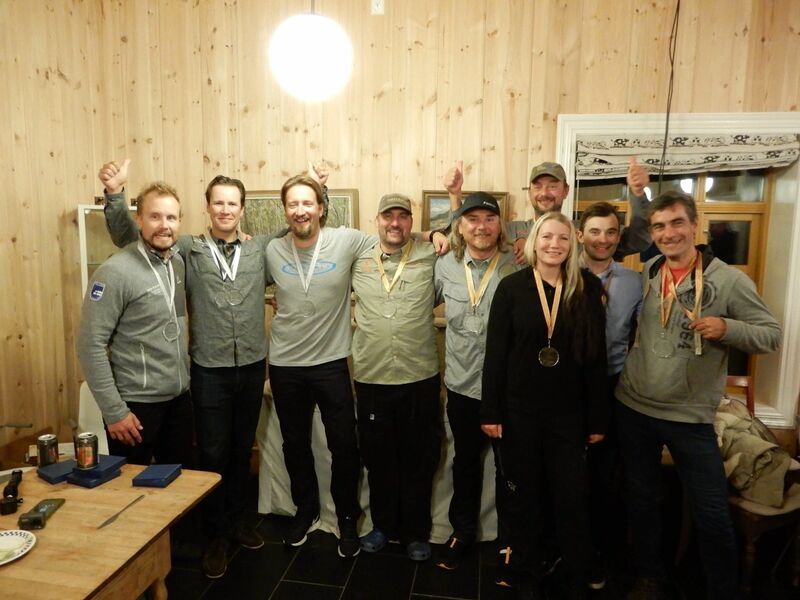 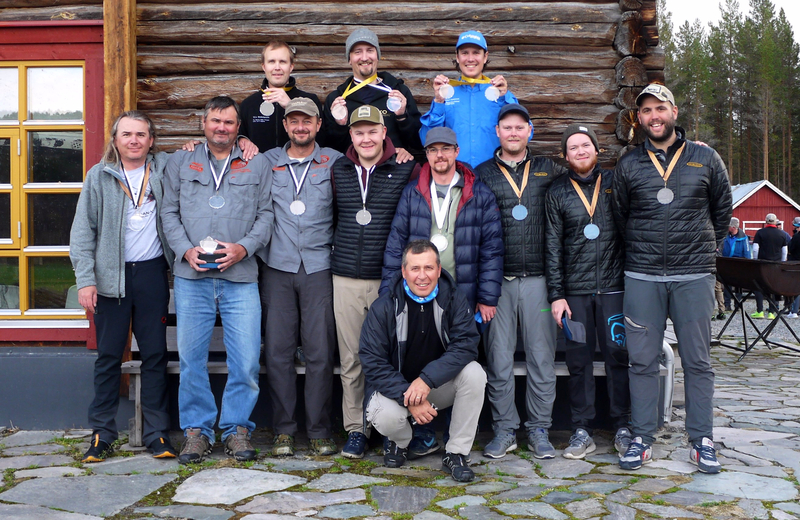 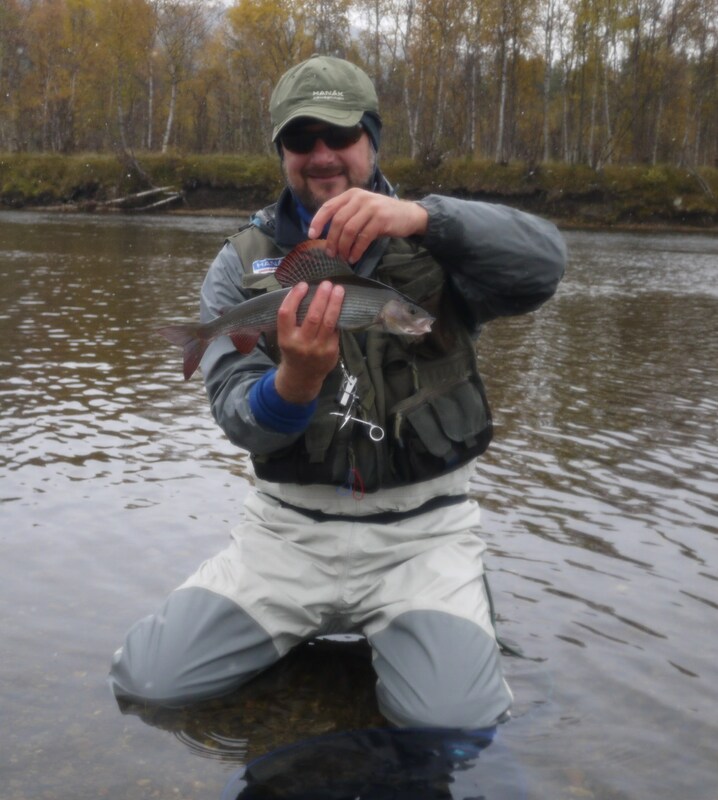 In fact, it is very often very short period to manage the trip, it is just after ice melting in river and before masive spring snow melting and rains in mountains. 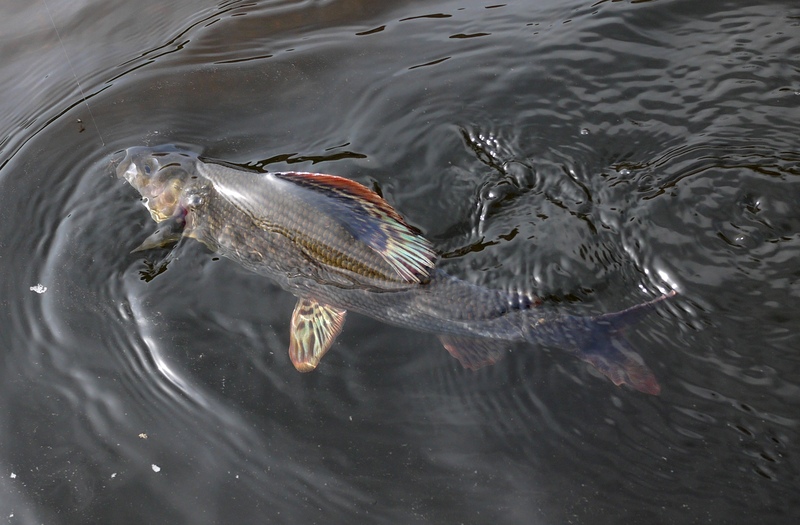 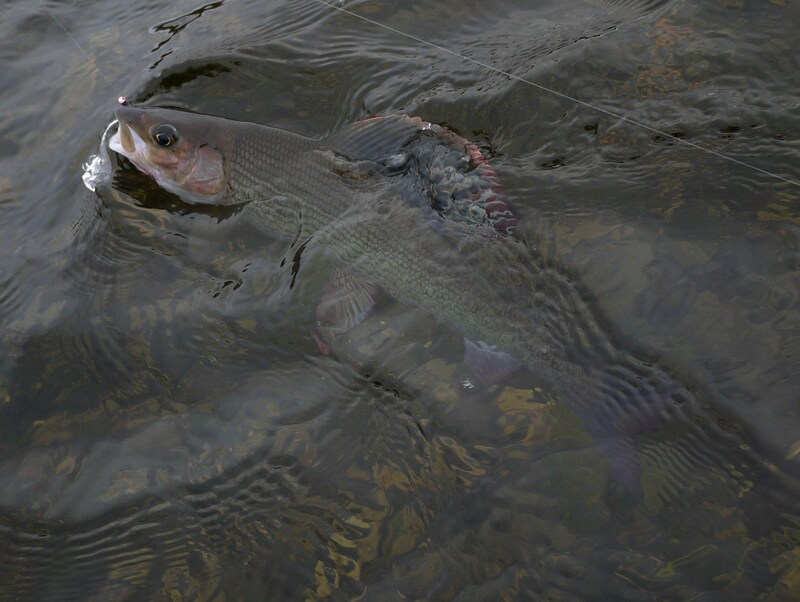 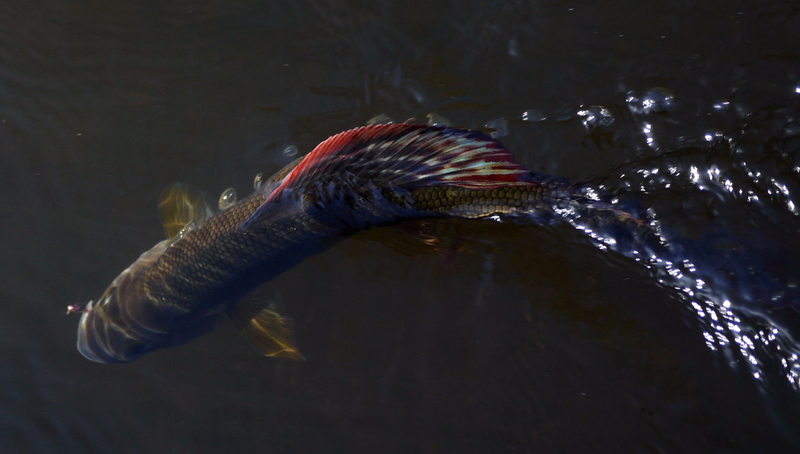 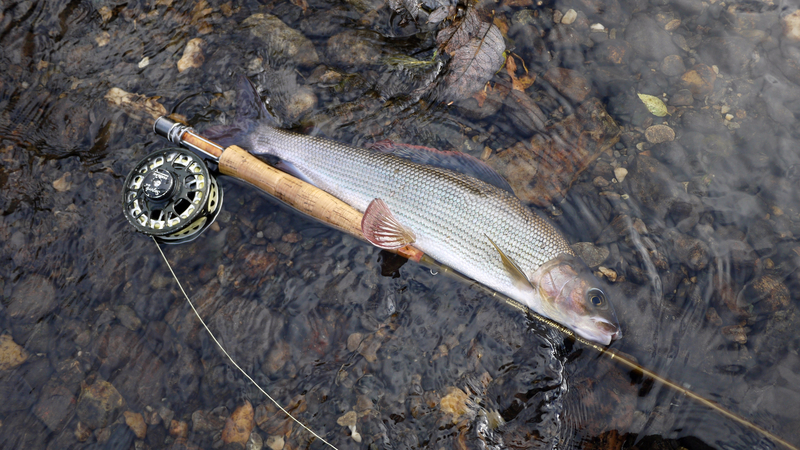 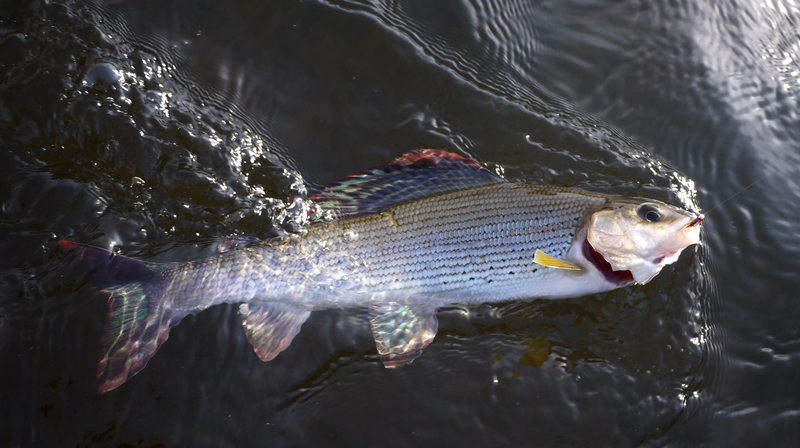 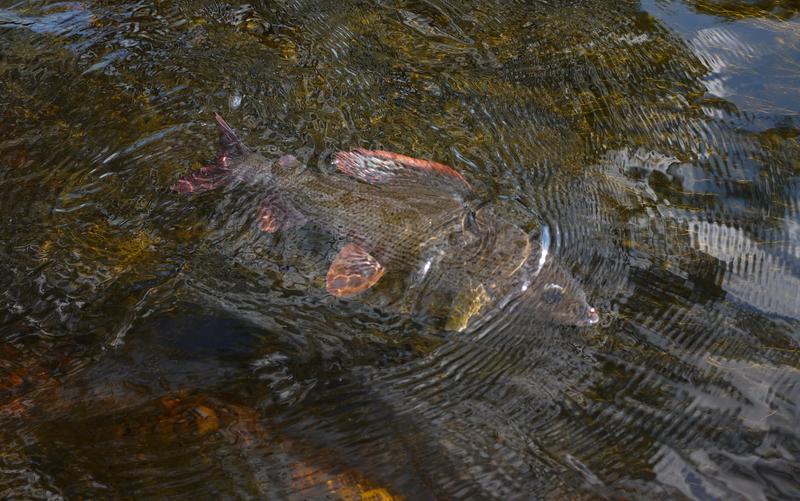 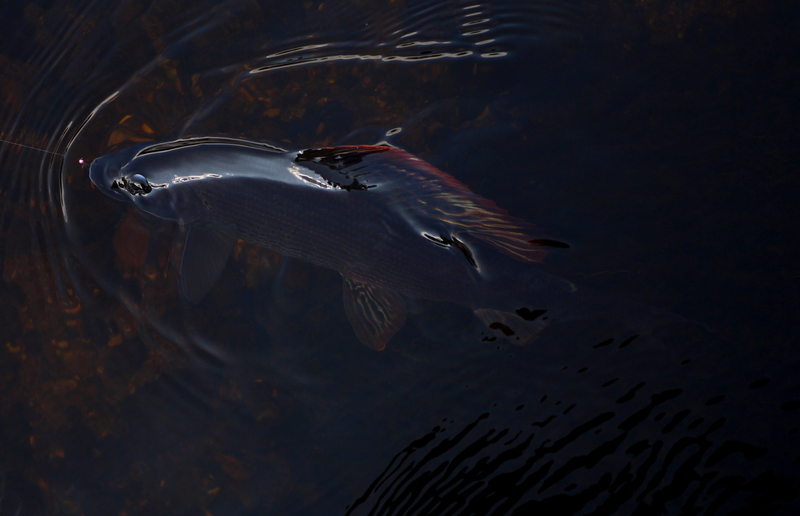 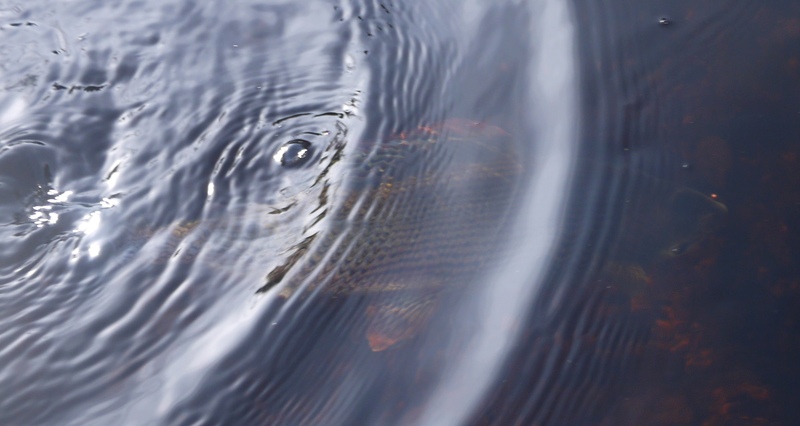 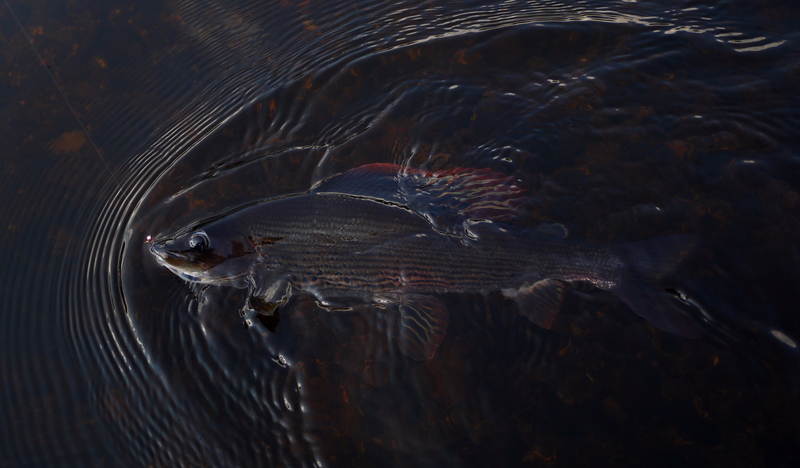 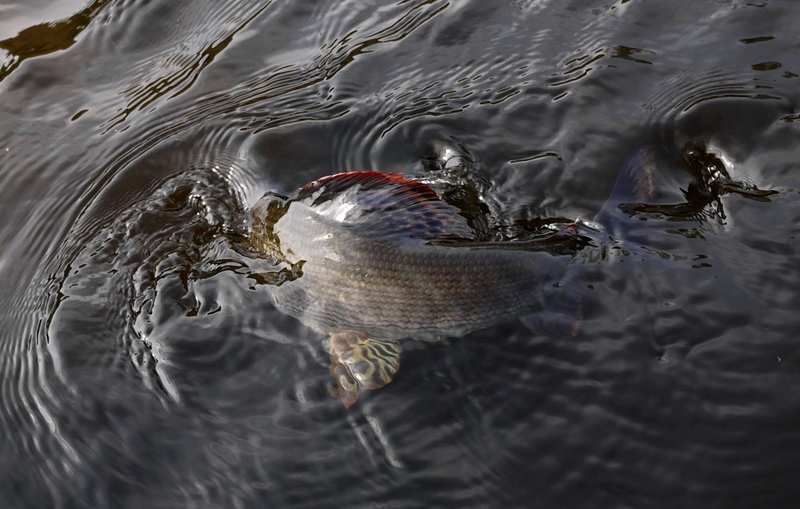 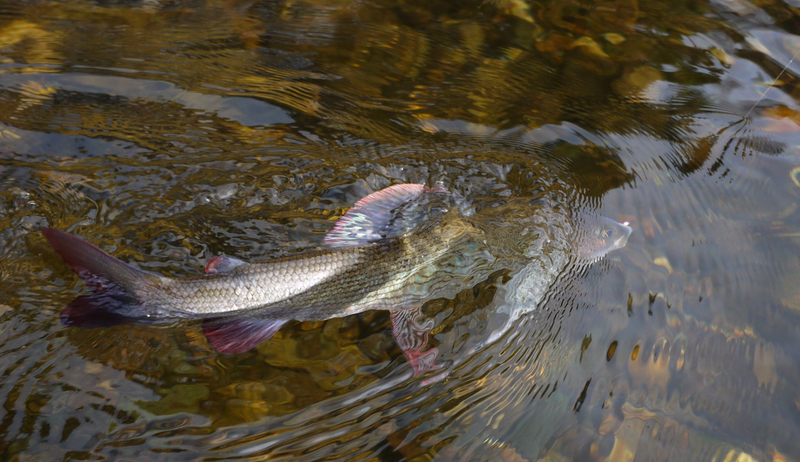 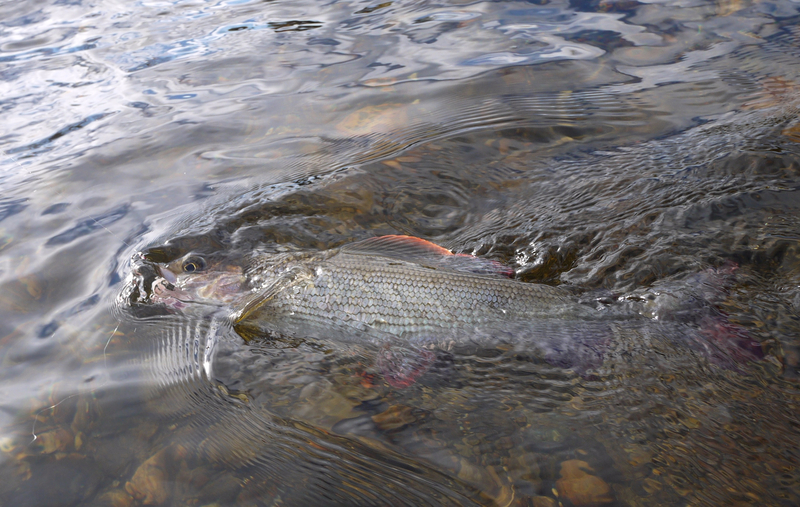 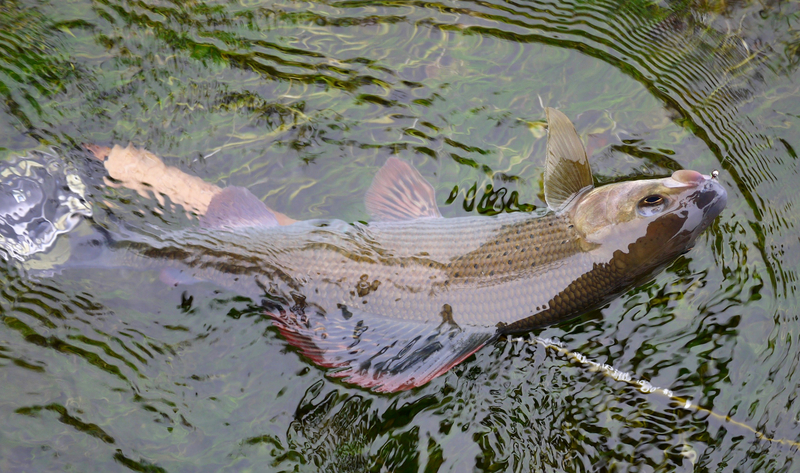 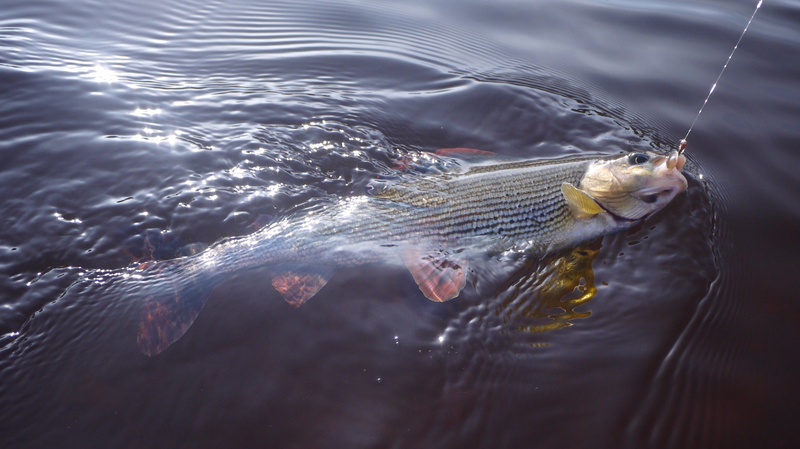 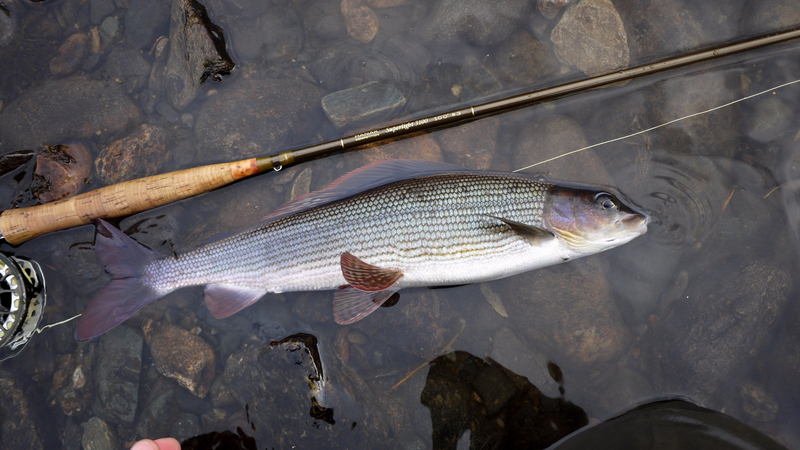 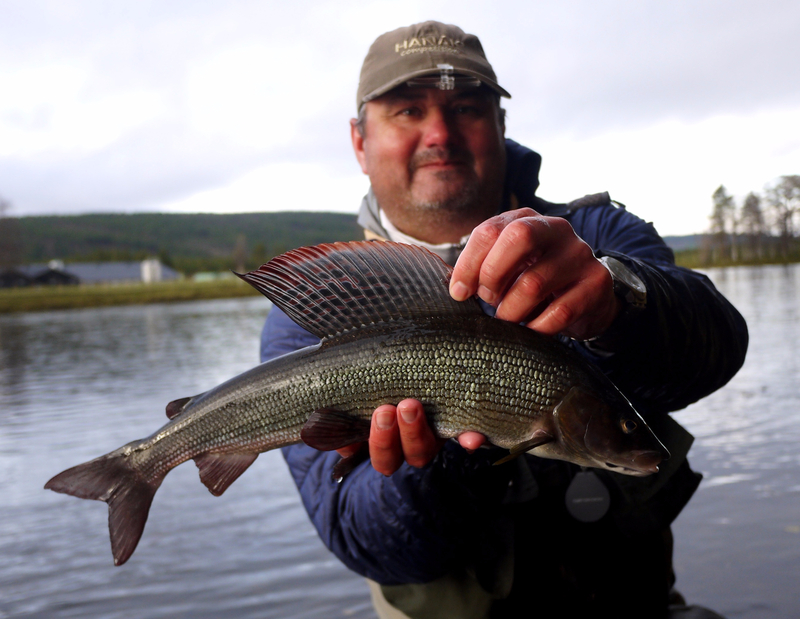 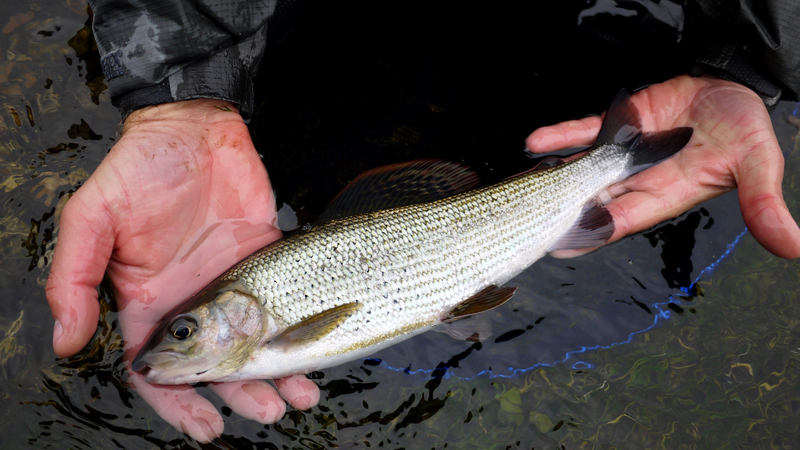 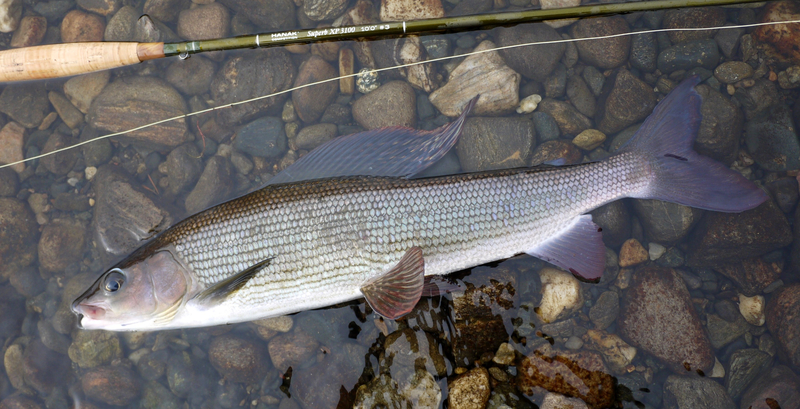 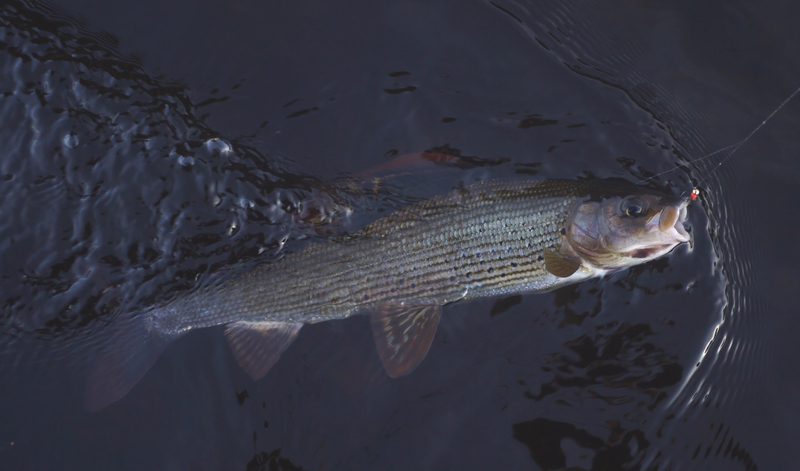 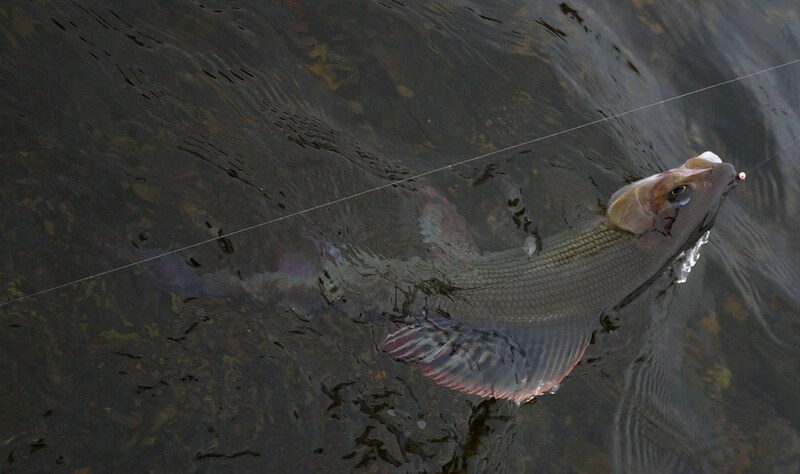 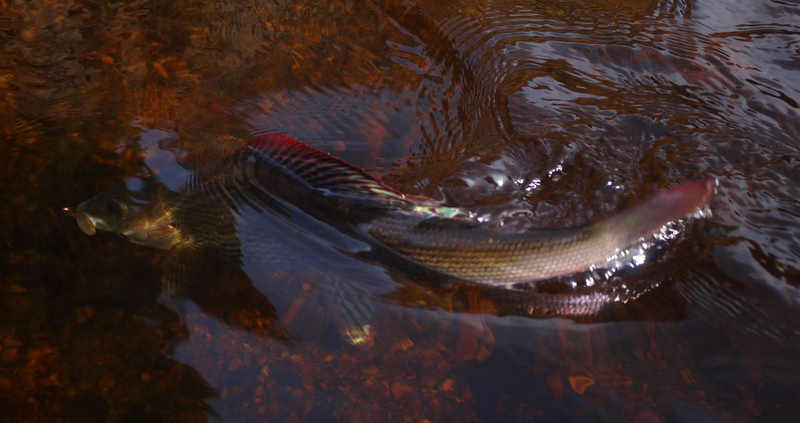 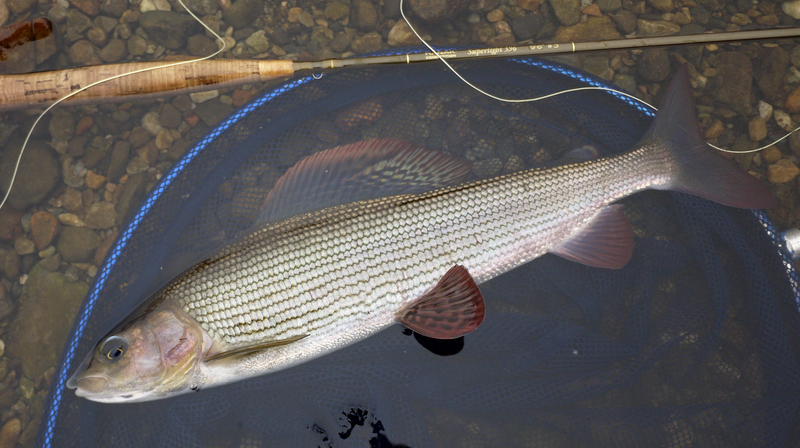 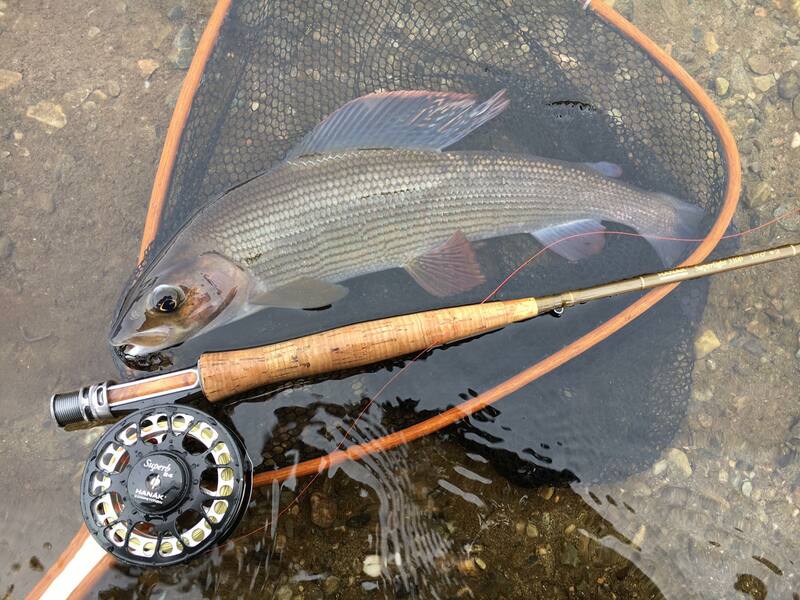 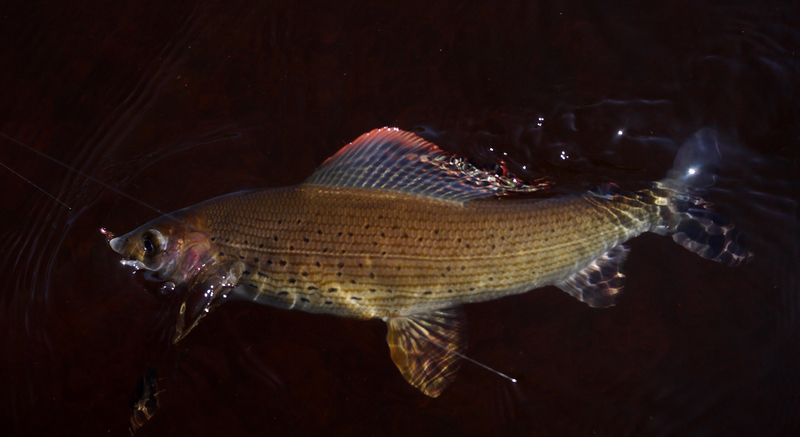 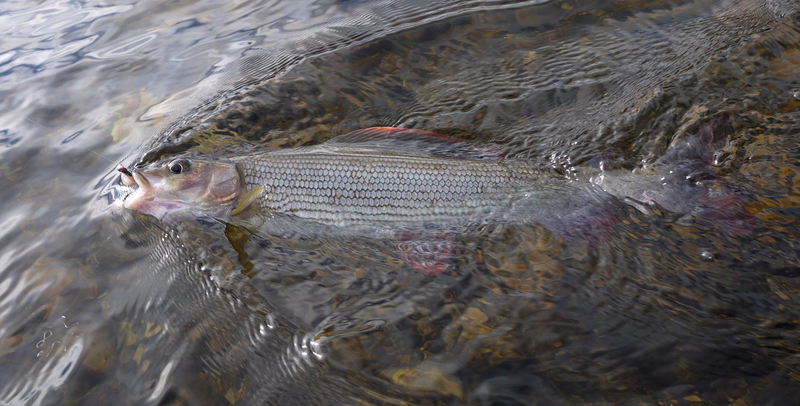 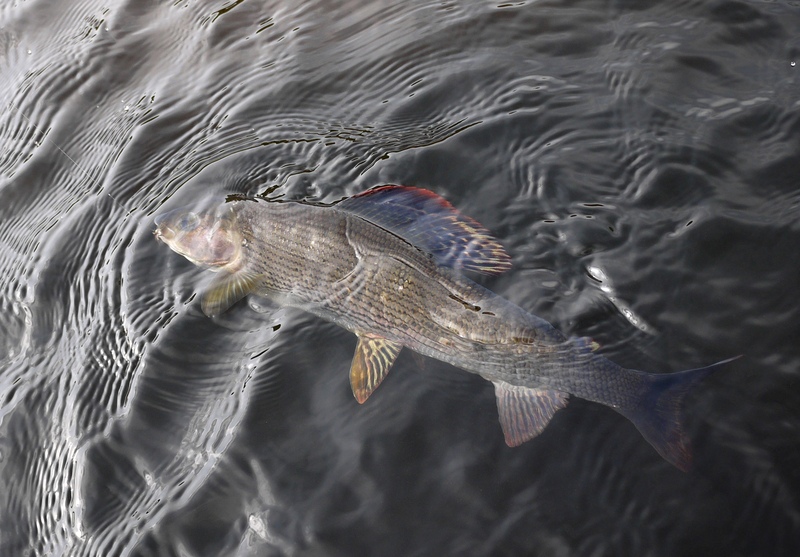 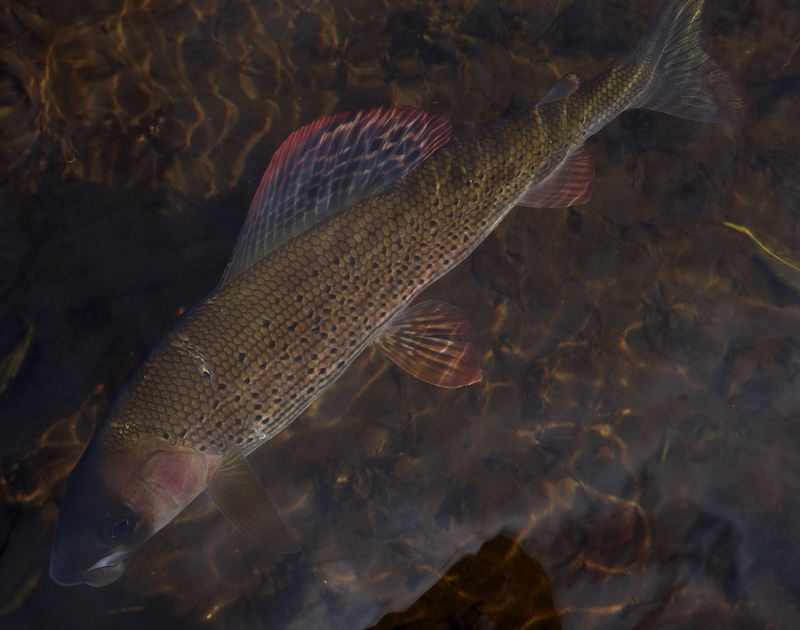 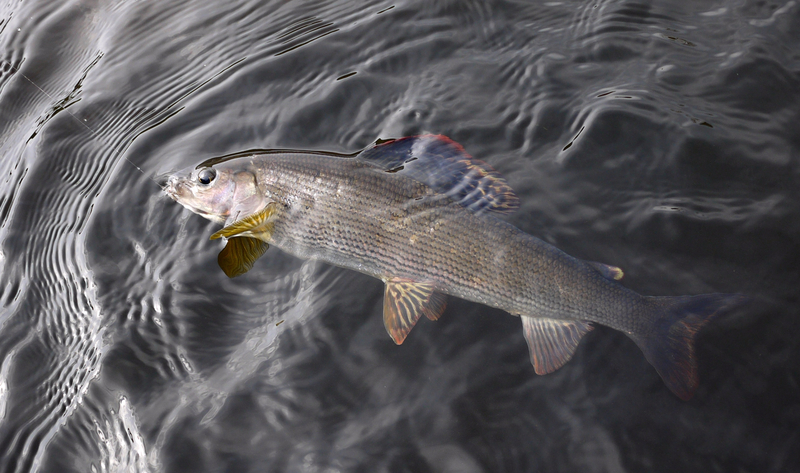 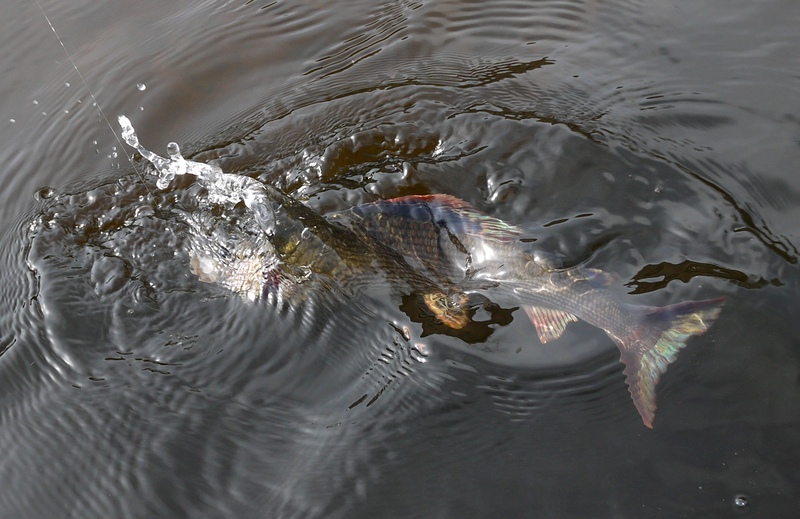 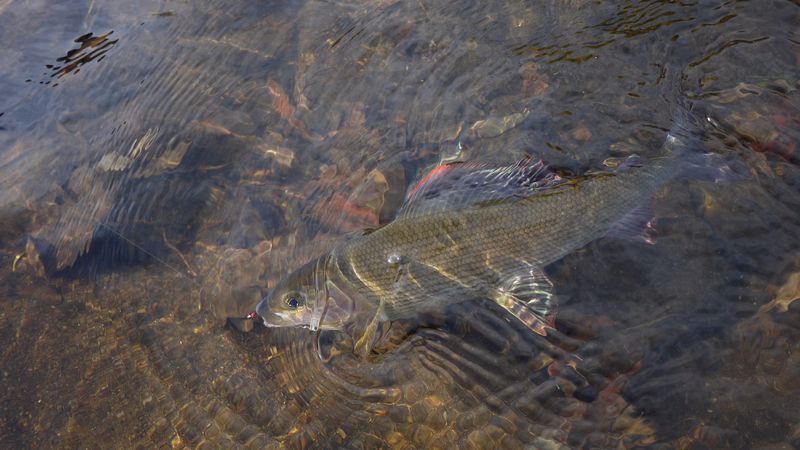 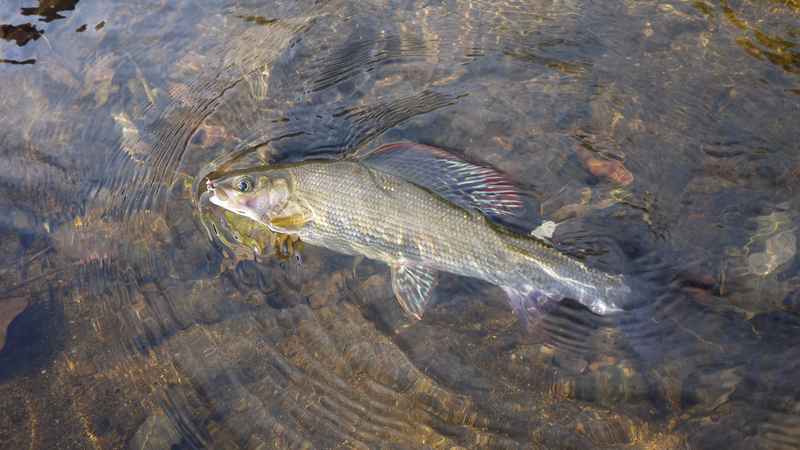 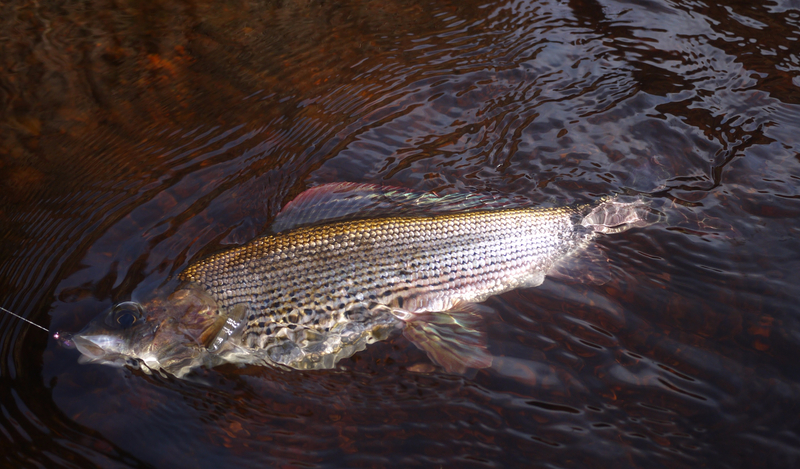 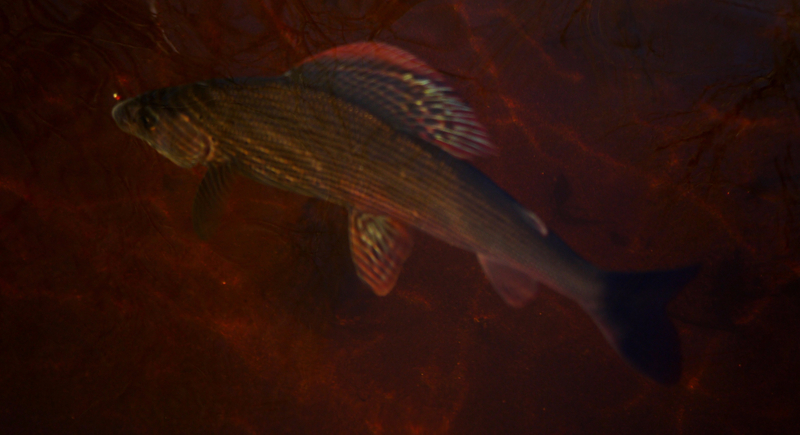 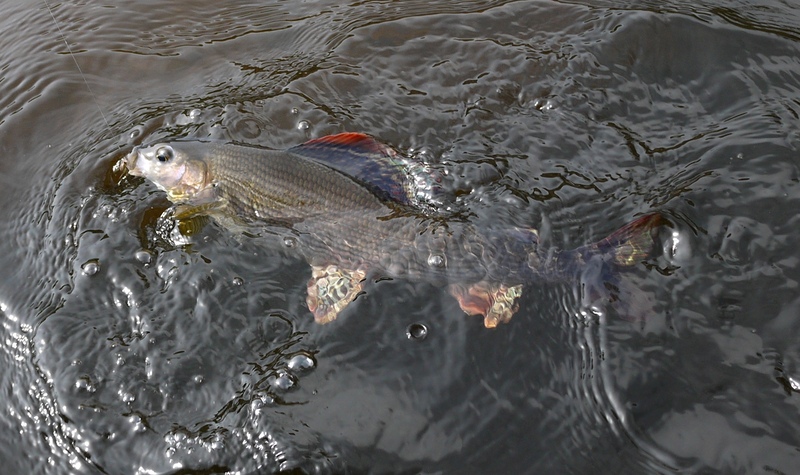 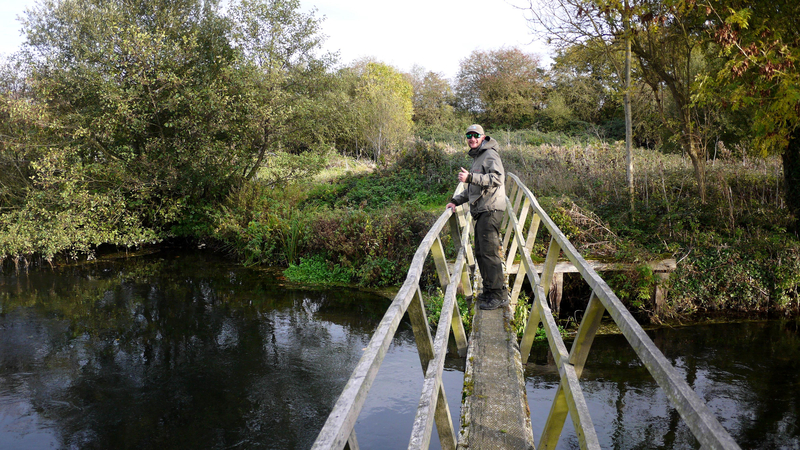 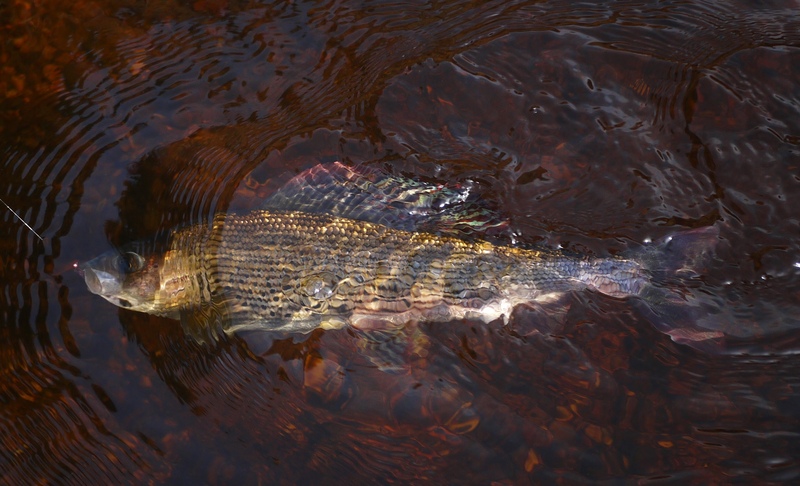 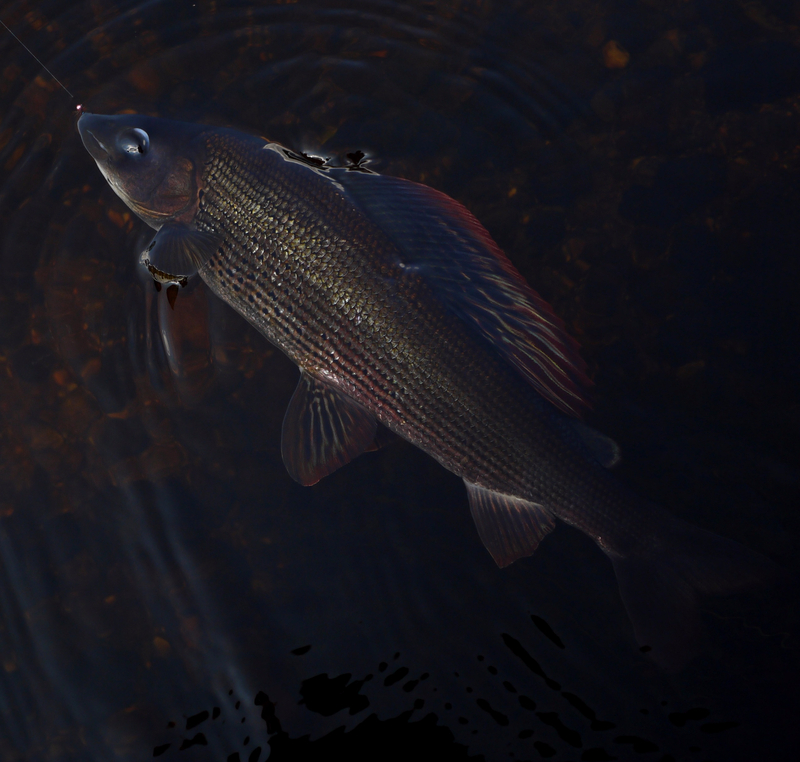 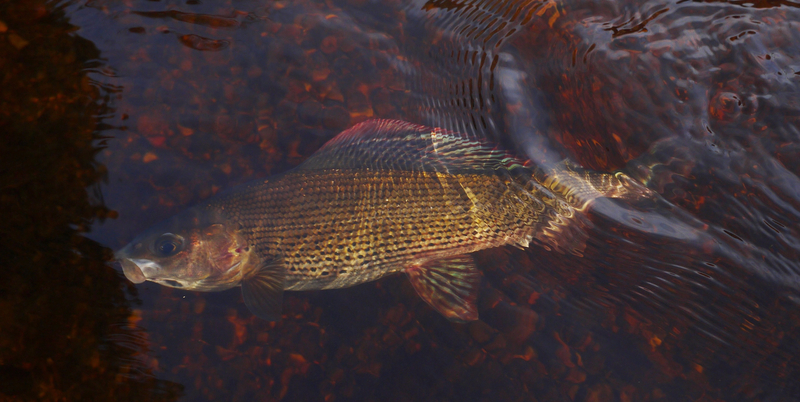 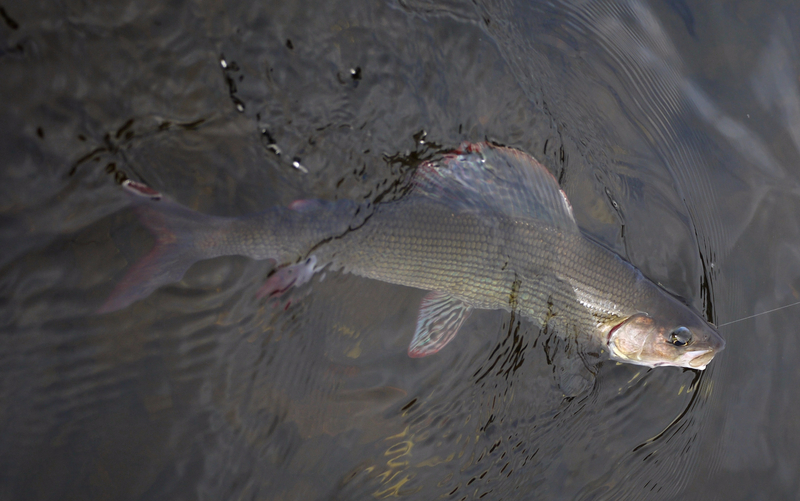 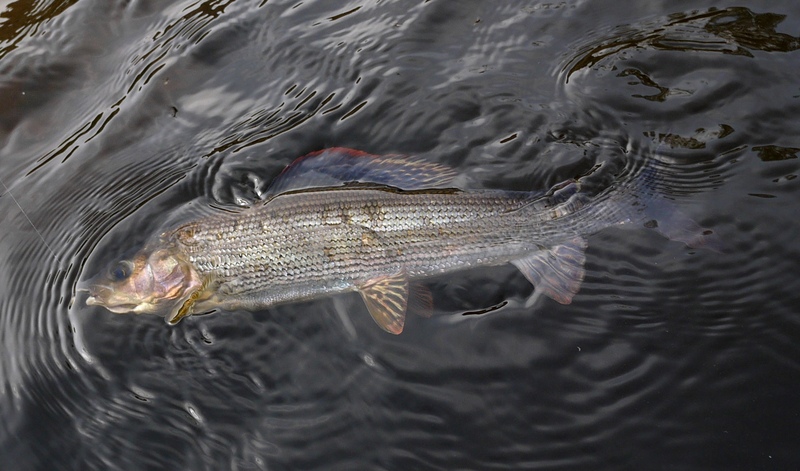 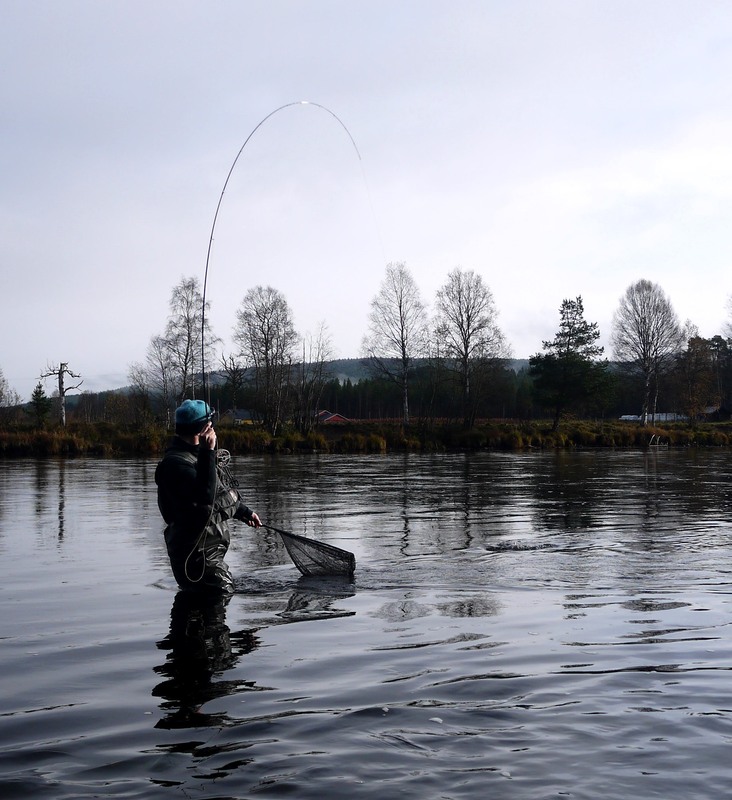 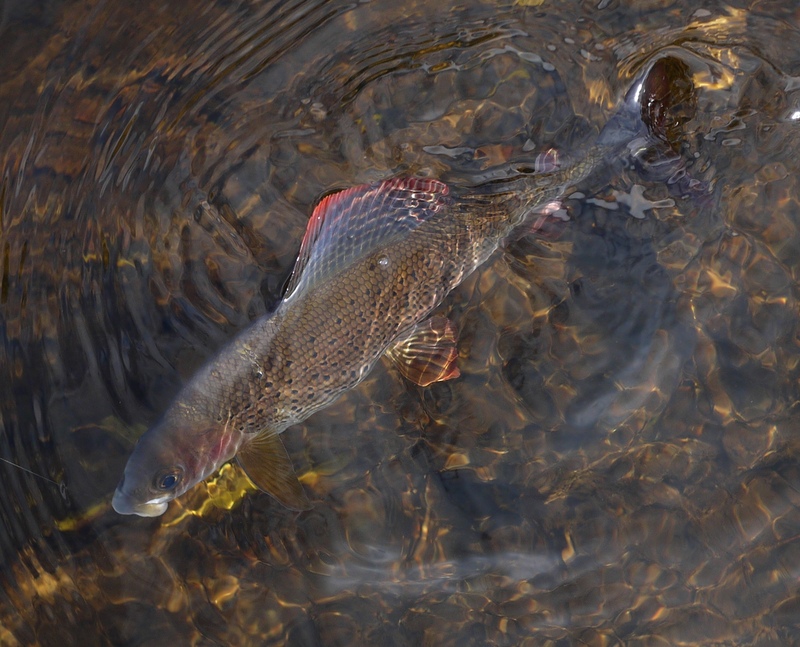 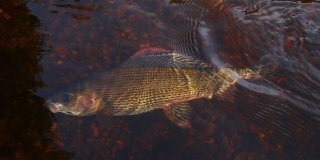 More over, in April and May, fishing is banned here because of spawning time of grayling. 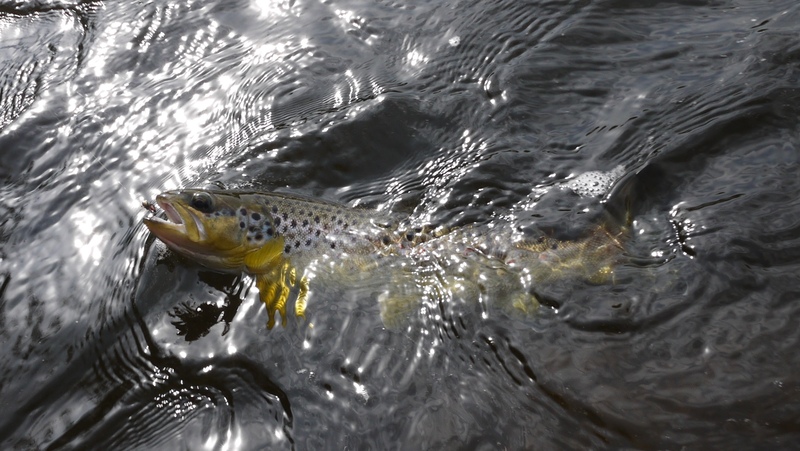 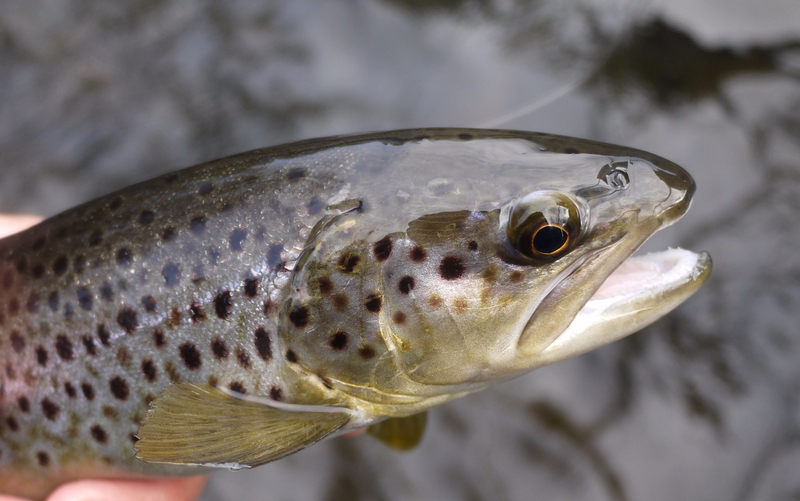 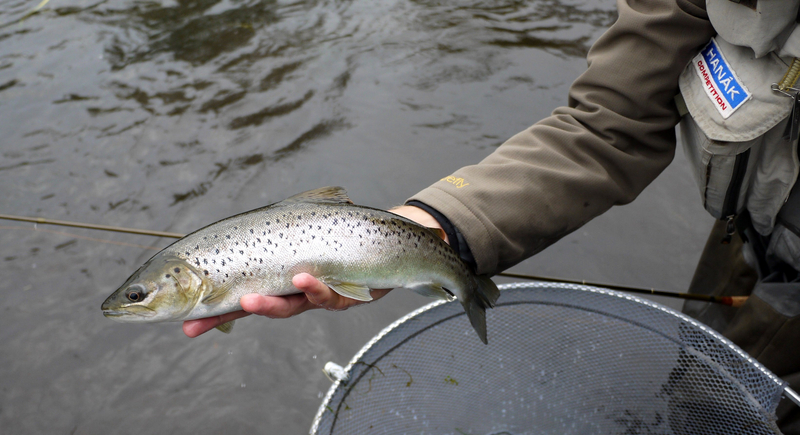 In this time, very often you can meet also nice trout, we found out during one of our scientific project, that brown trout descent from all streams after spawning in October to lower parts of river to survive winter. 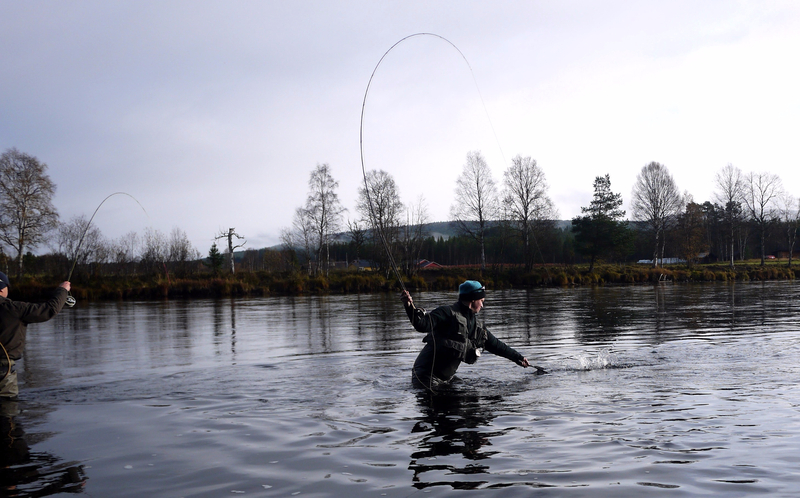 It is never about many takes, but we always catch some nice fish, enjoy one of the first spring days out in the pure nature. 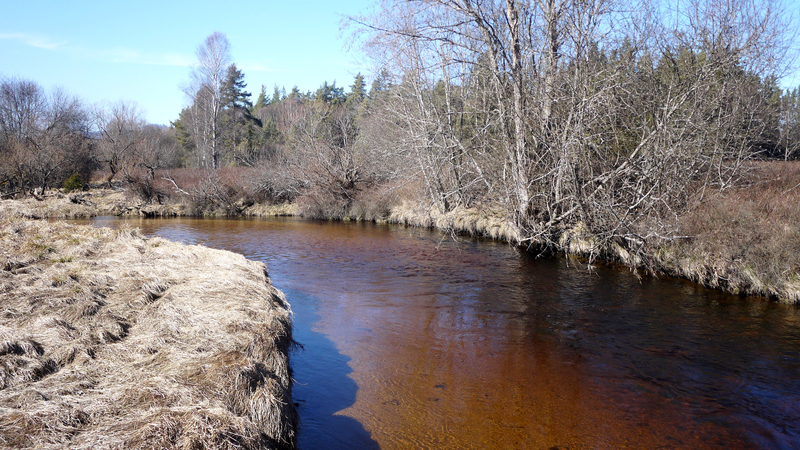 And as the manager of the water, I´m always curious whether fish survived winter and in what condition they are before spawning. 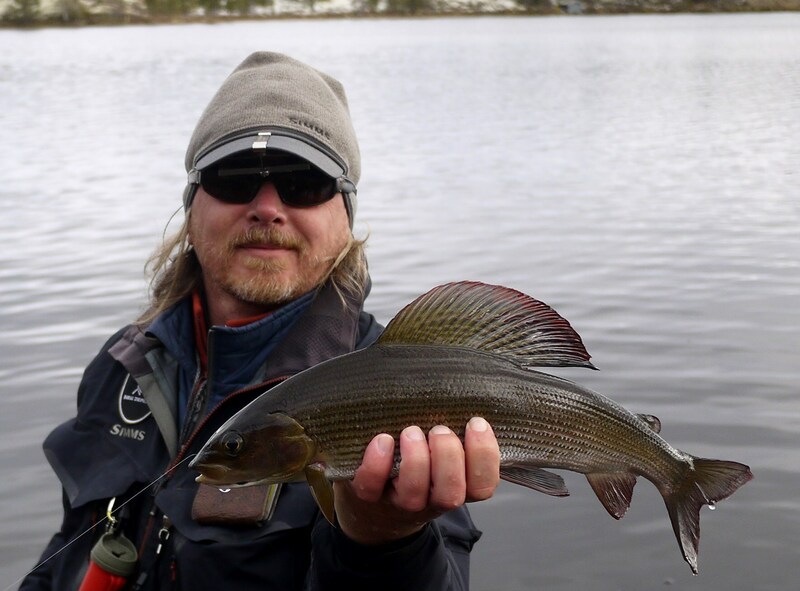 There are some discussions whether is ethic to fish for grayling before spawning, I thing, that fishing in winter is safer for fish than fishing in summer. 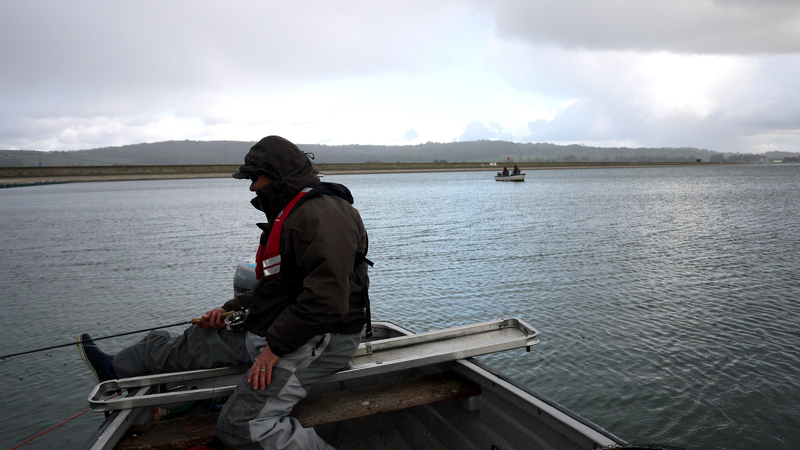 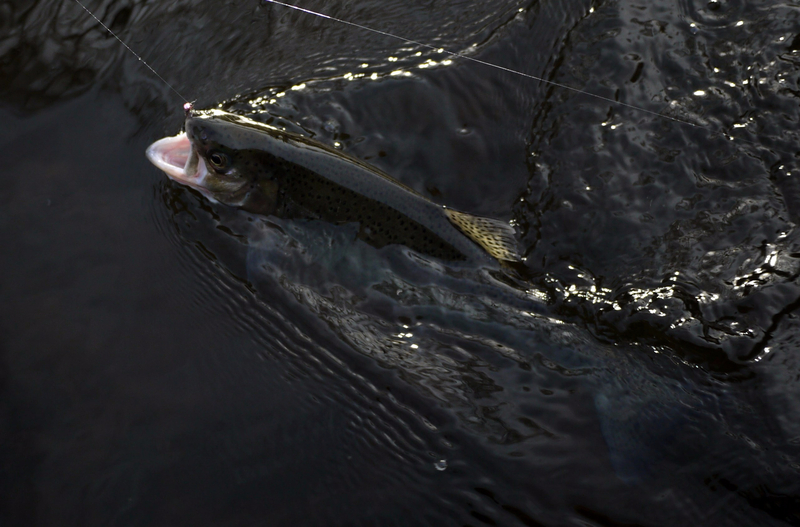 In winter, water is ice cold, full of oxygen, fish does not fight hardly, and all are released with minimal injury. 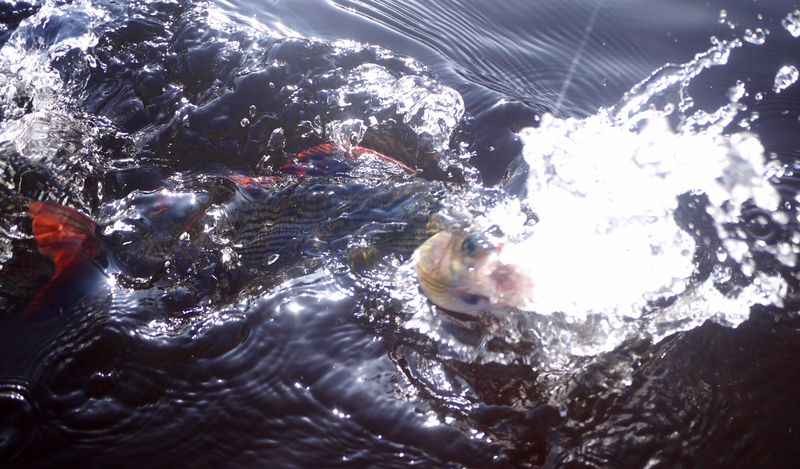 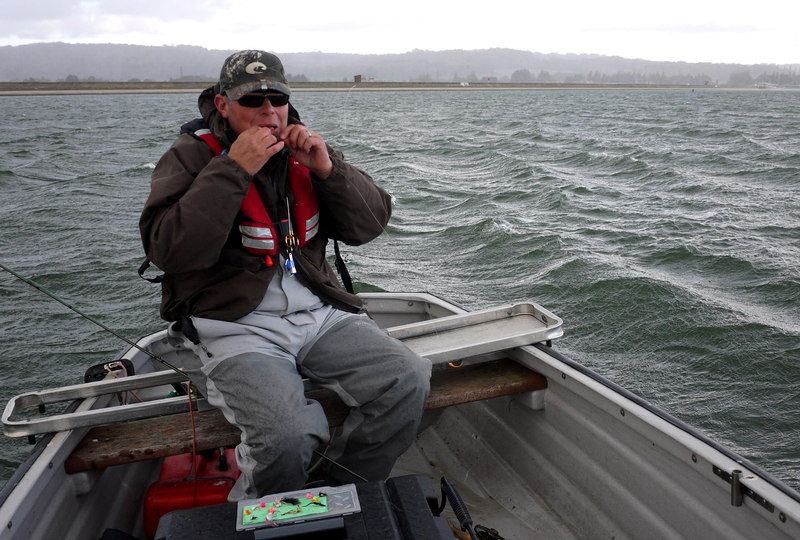 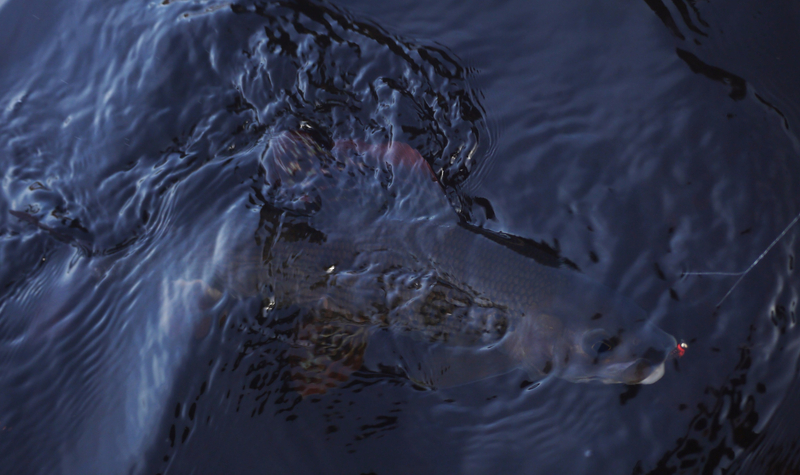 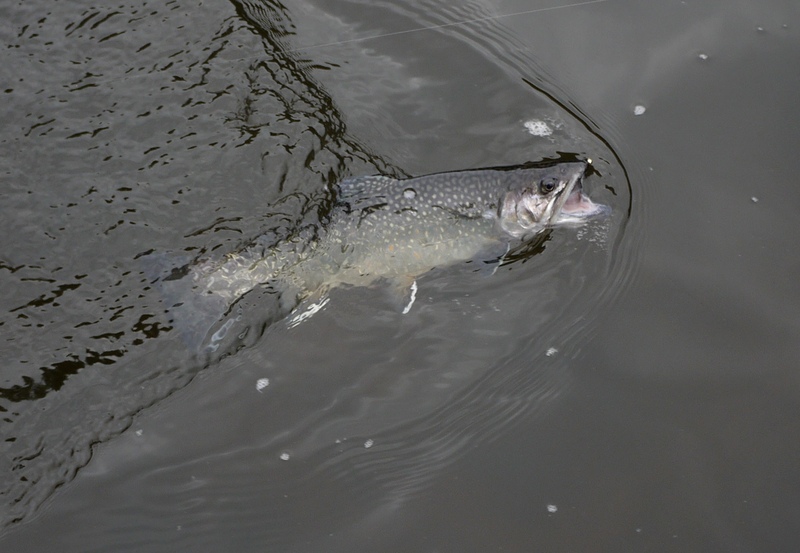 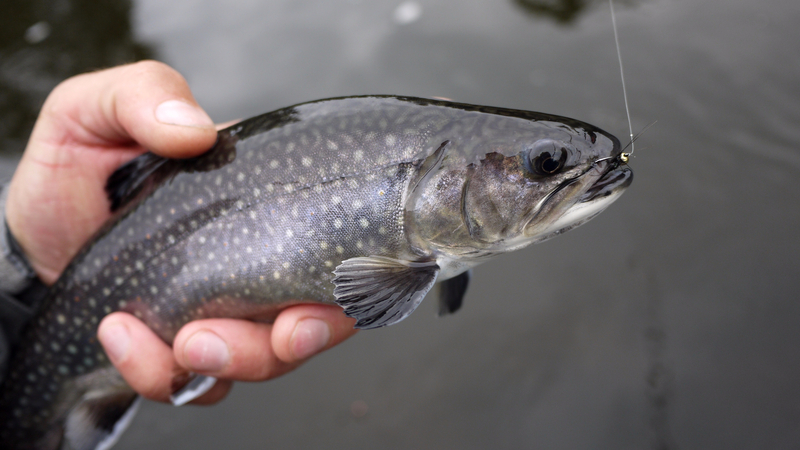 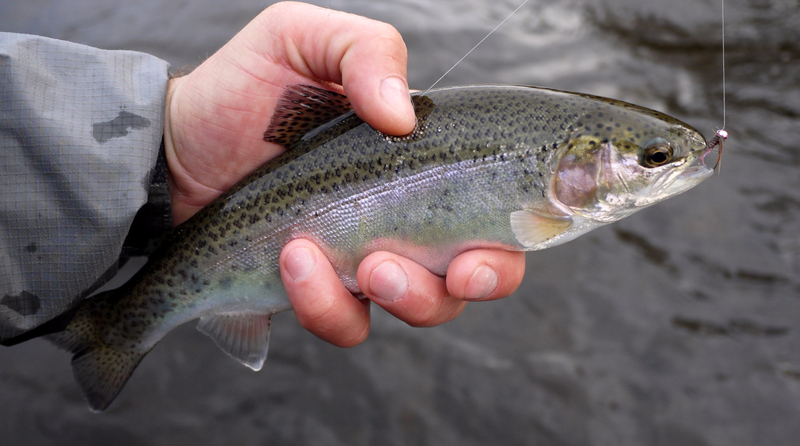 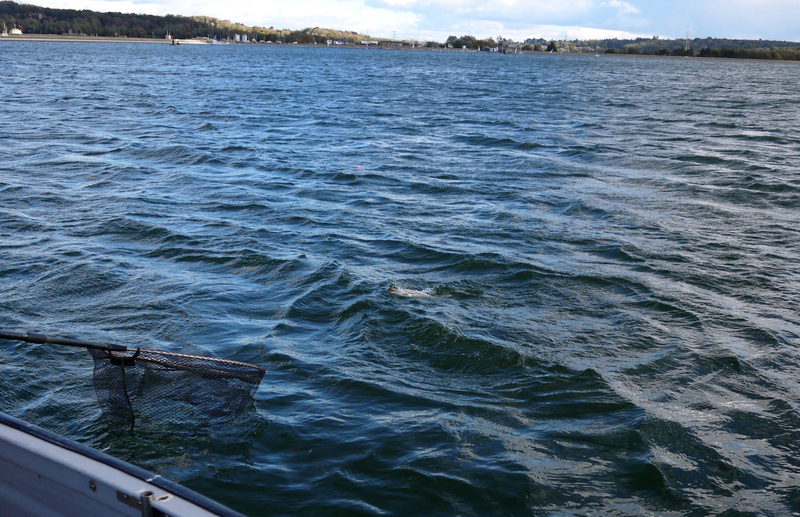 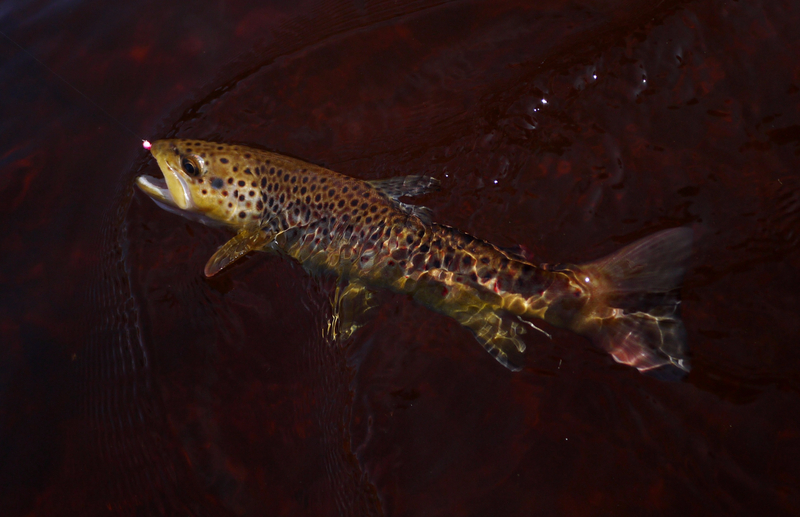 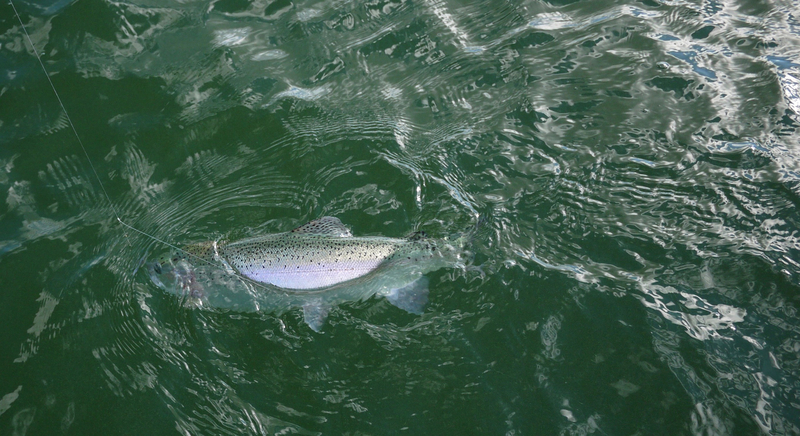 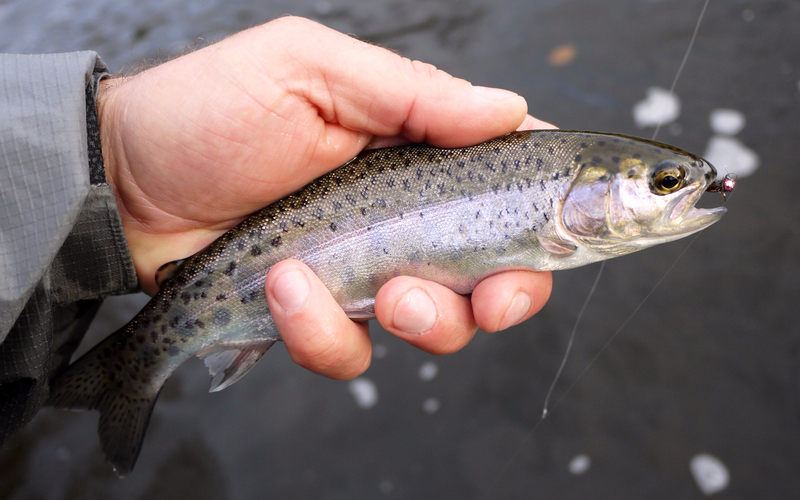 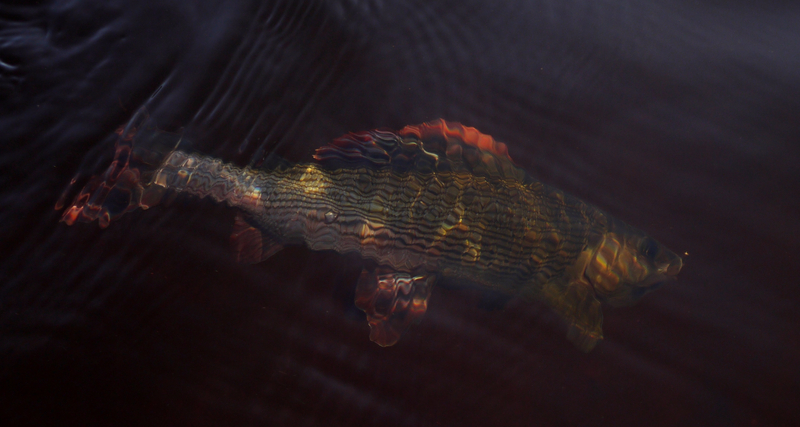 In summer, water temperature is higher, fish fight longer and risk of damage and also consecutive mildewing is higher. 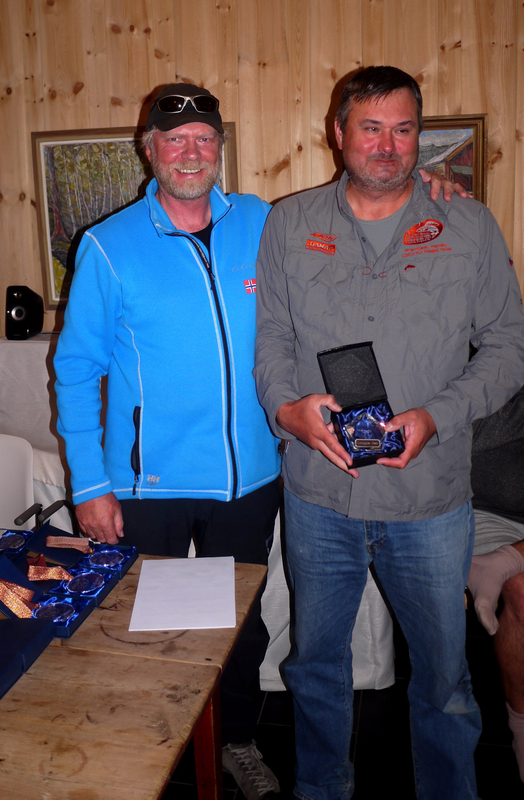 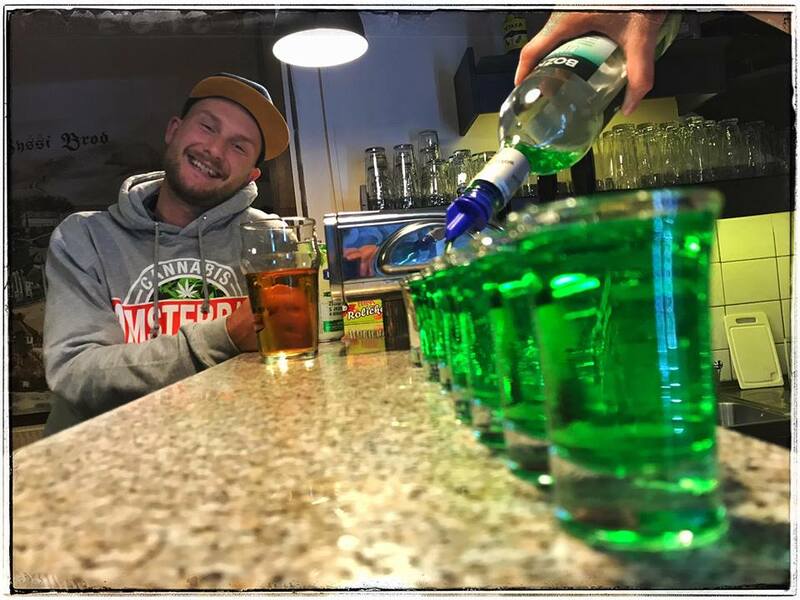 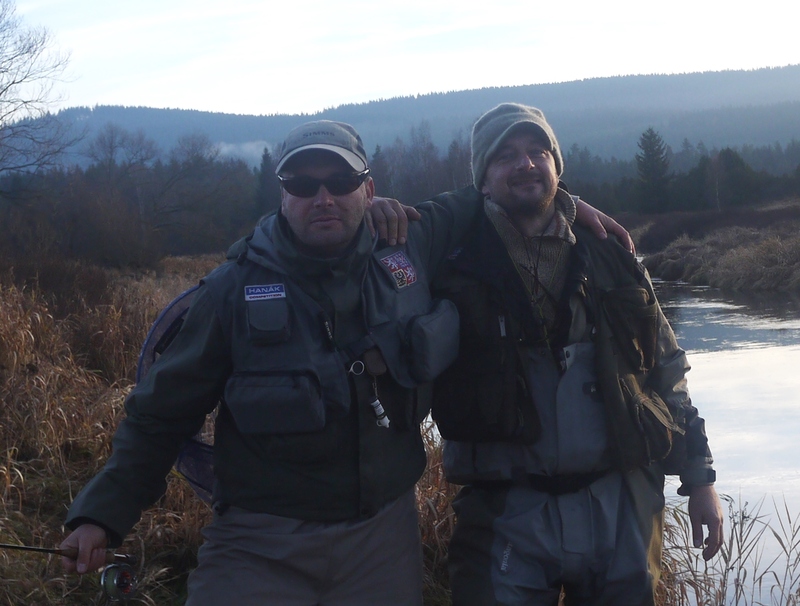 I usually fish in rivers in winter till March, in April and May I focus on lakes and sometimes I visit our trophy water Vltava 24. 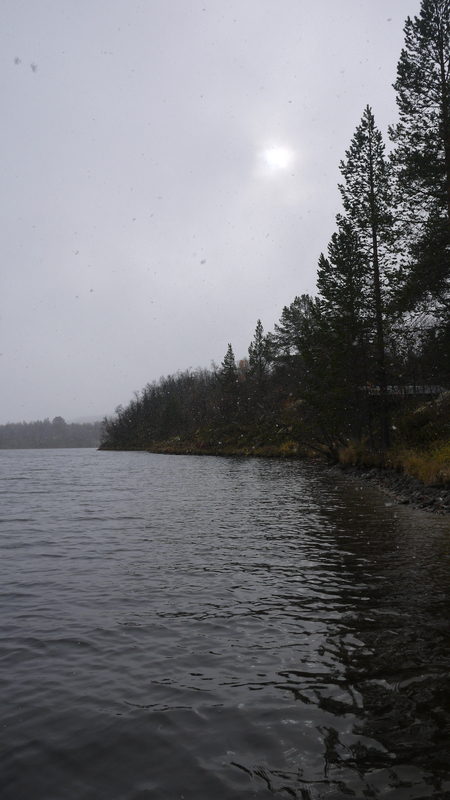 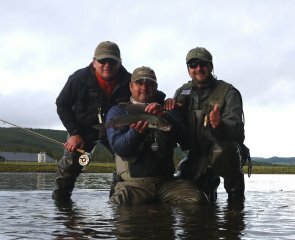 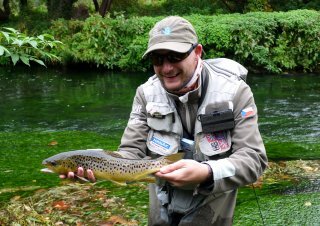 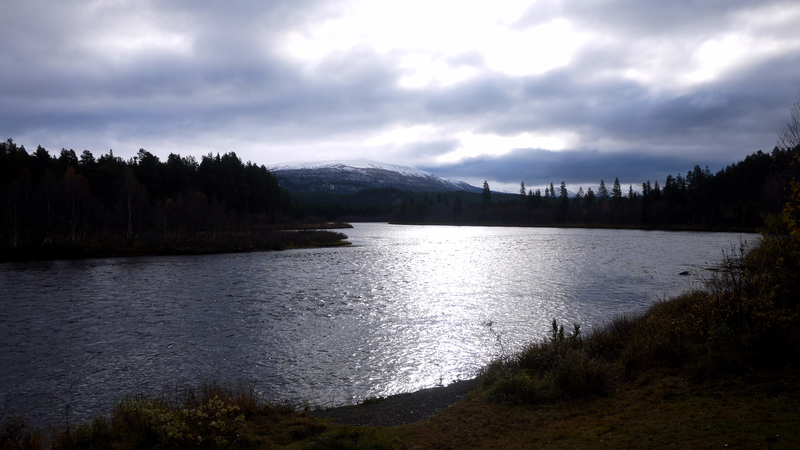 In this months, all fish except brown trout have spawning time, water is usually higher and muddy and still cold, I don´t like it. 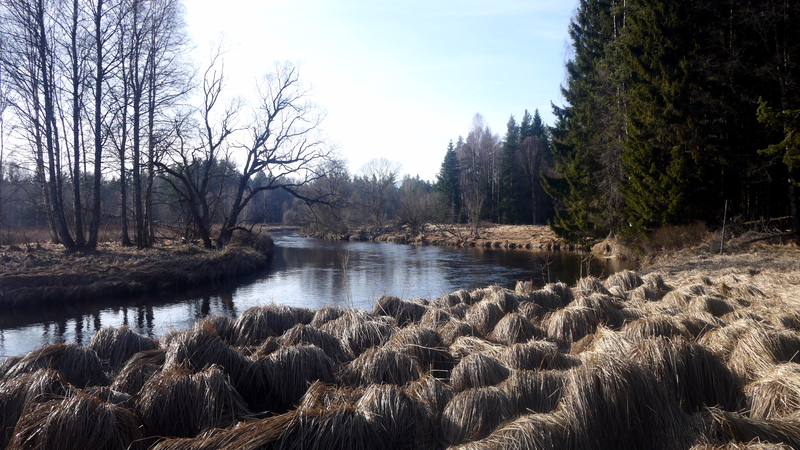 I always return to rivers in the end of May when first sedge is hatching. 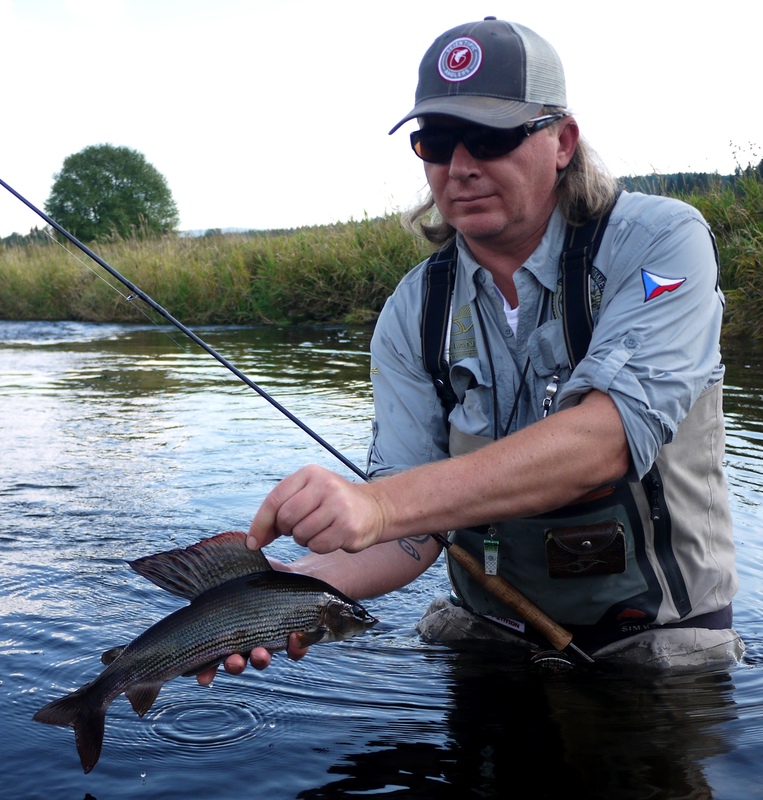 One of my challenges during my work for the Czech Angling Union is recovery of the population of grayling in Vltava river between Vyšší Brod and Český Krumlov, which was destroyed by wintering cormorants 15 years ago. 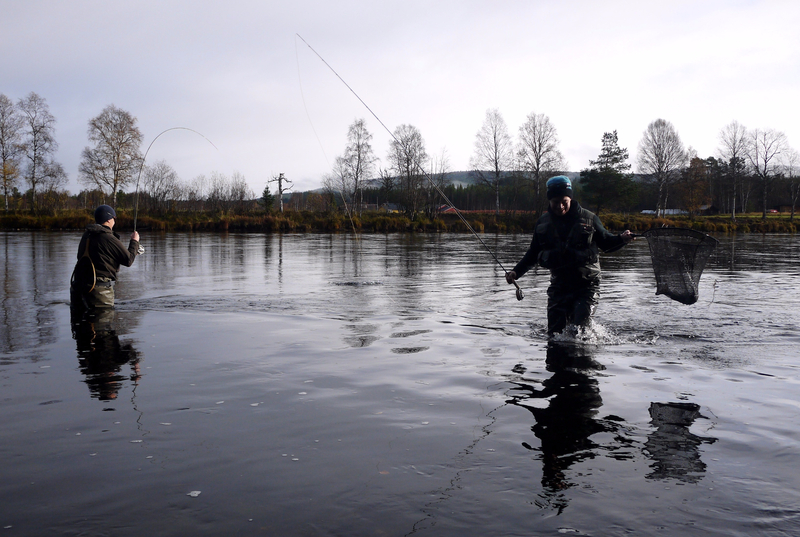 Before winter, we decided to check grayling which we regularly stock to the river inside of the town of Český Krumlov, where fish are a little protected. 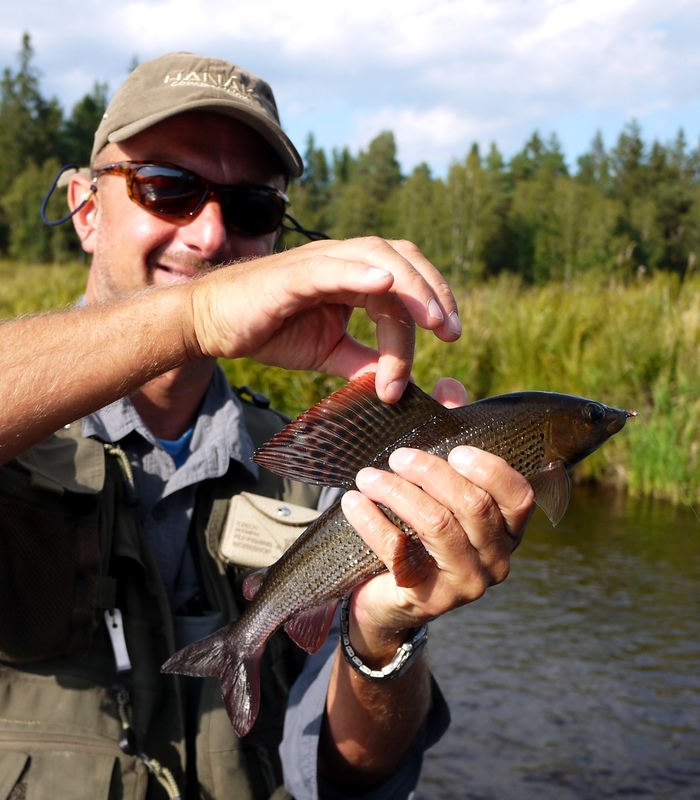 Moreover, we stock fish also to the small right inflow called Polečnice which is also suitable for grayling, in pas time, the brook was full of graylings. 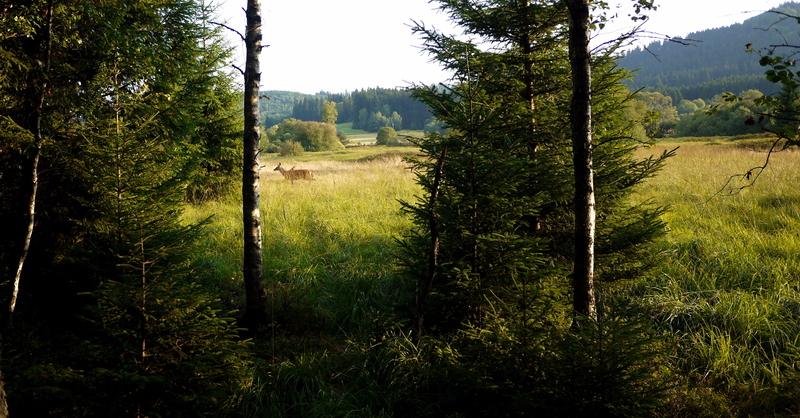 I met Jiří there at about lunchtime. The three-years old fish were in great condition and they occurred mainly around the intake, I was fishing 3-size Sage SLT, 0,10 fluorocarbon HC and nymphs size 16 and it was funny. Any nymph with silver of pink bead was working, but the PTN with silver bead and orange neck was the best. 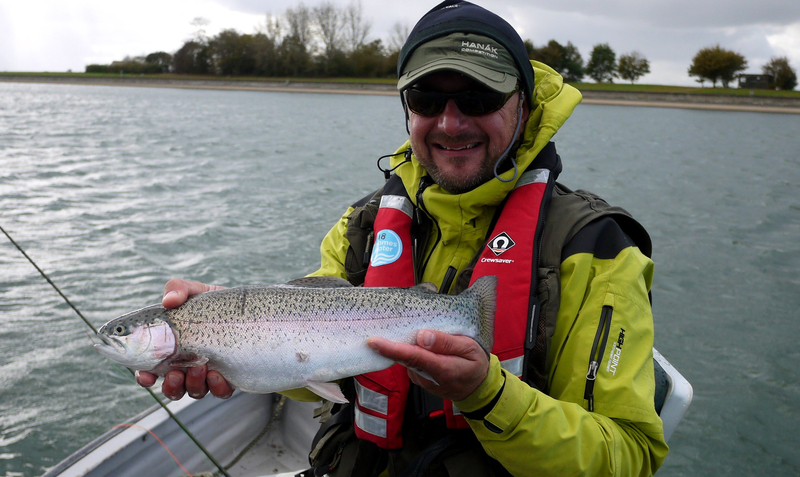 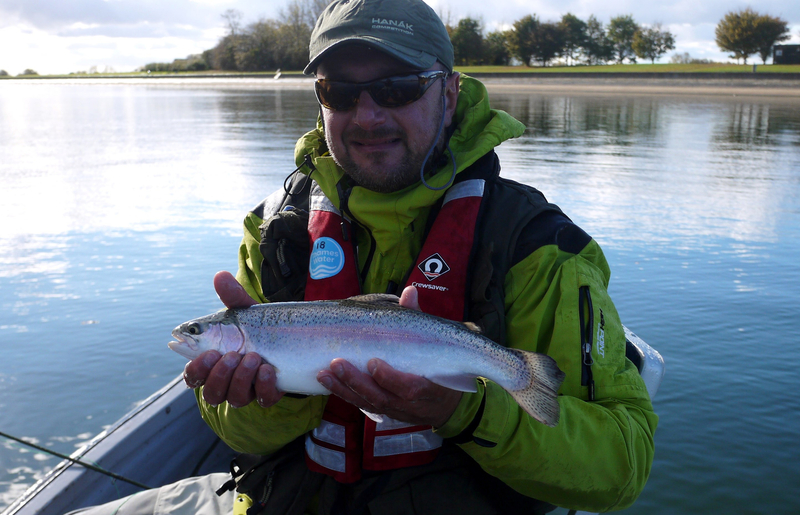 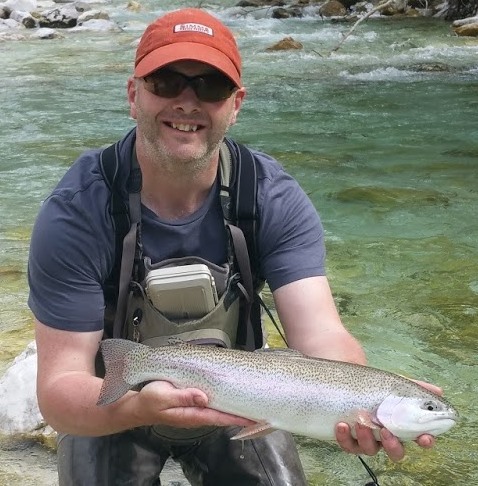 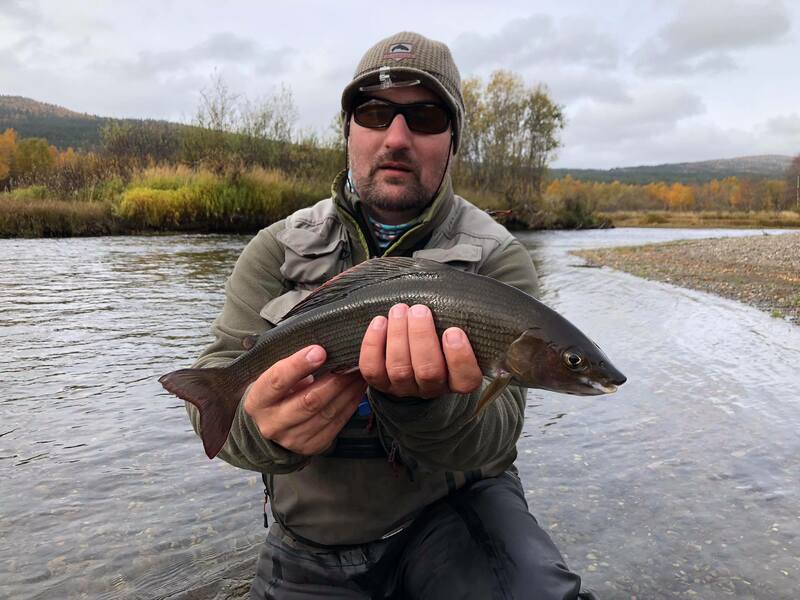 After two hours we moved upstream from the town to catch something for table, I caught few small coarse fish, small barbel, few small browns, one smaller rainbow, and finally, in a big pool, I hooked good rainbow of about 50 cm, slimmer silver fish with big tail. 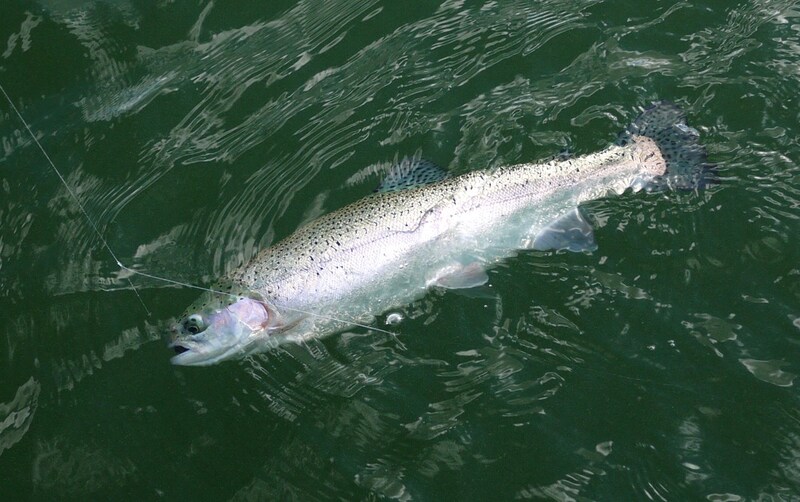 I was patiently playing the fish in the pool and the fish was relatively calm, I drew it to me and we were observing each other for a while, I imagined nice pink fillets, and the rainbow was probably a telepath and after three quick jumps left me with my imaginations Next time. What a nice day fishing. 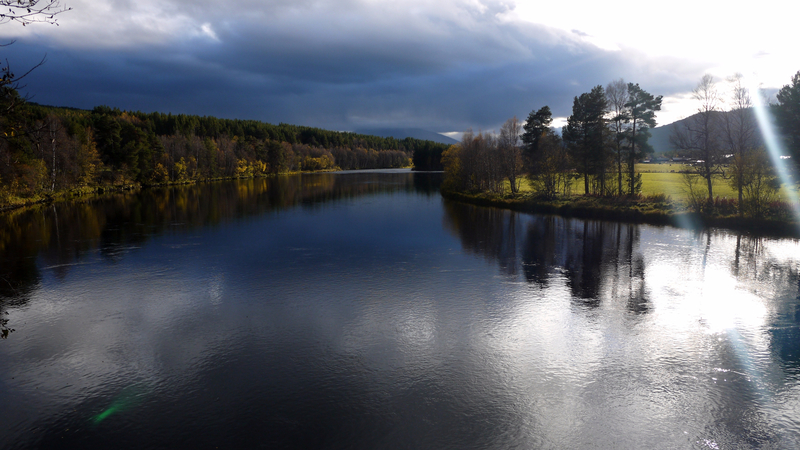 The panorama of one of the largest castle in the Europe is always nice. 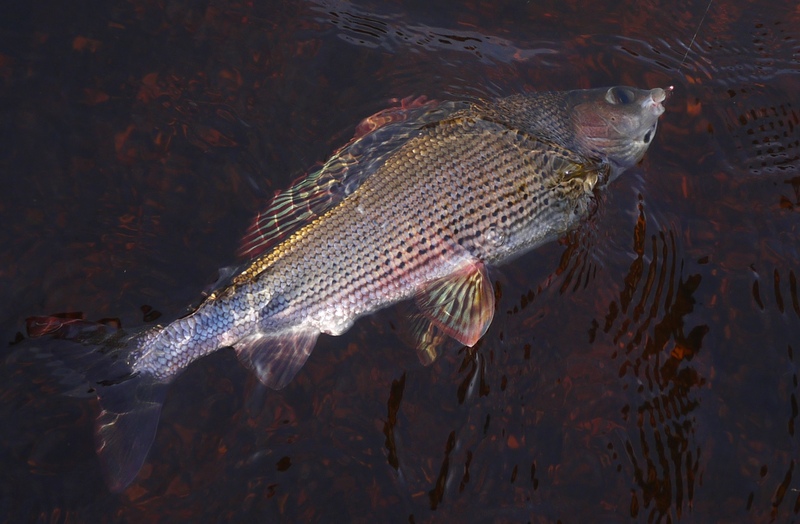 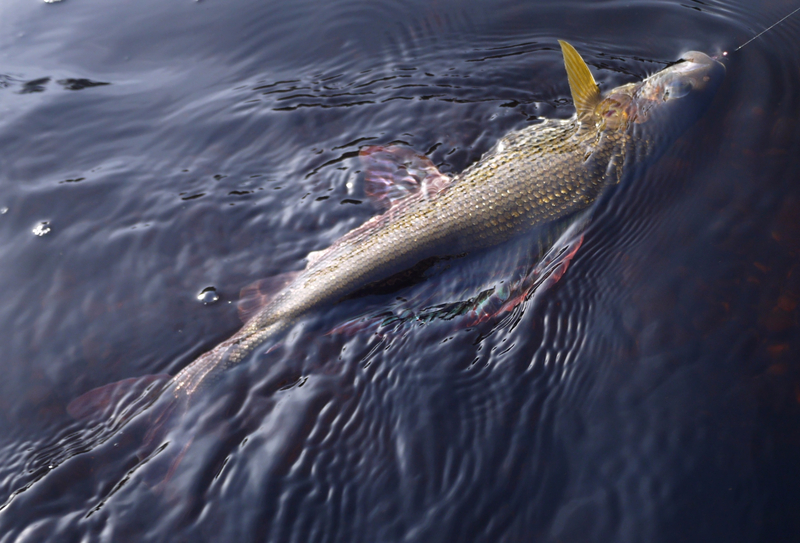 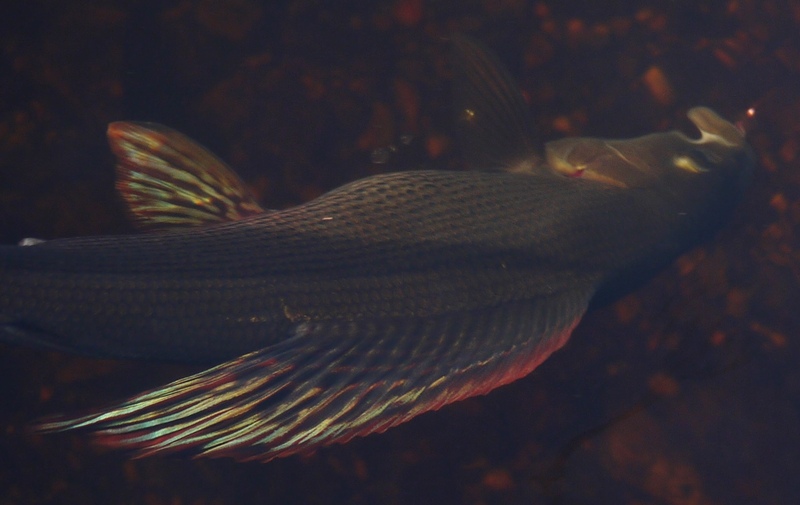 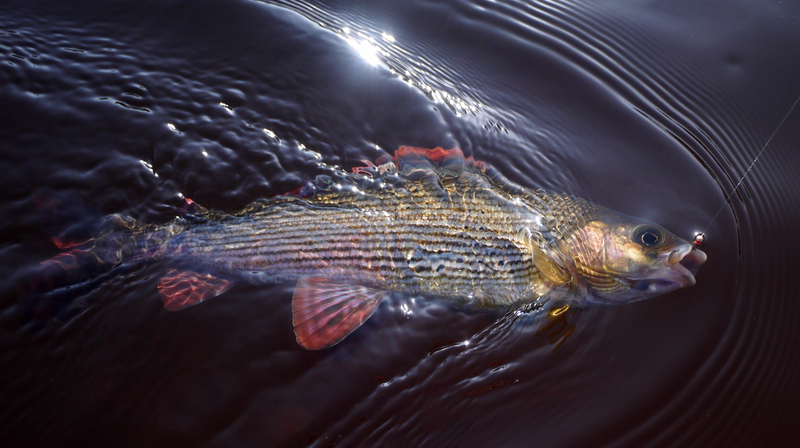 Fifteen years ago, we had problem with decline of catches of grayling. 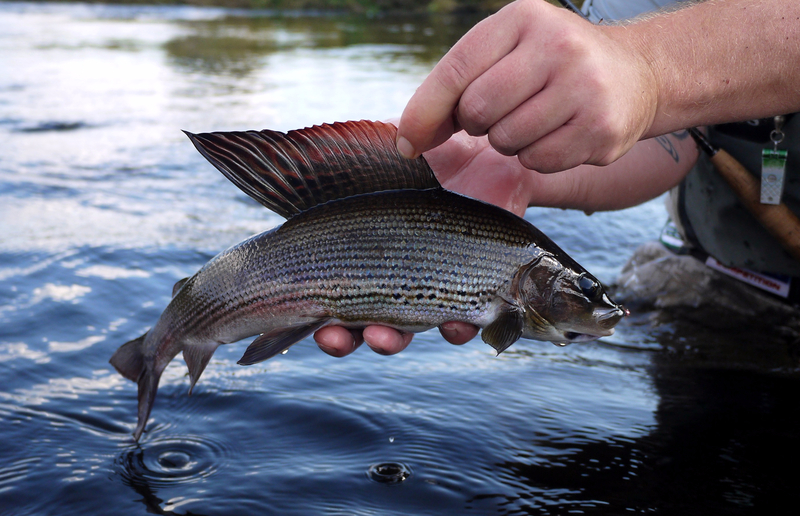 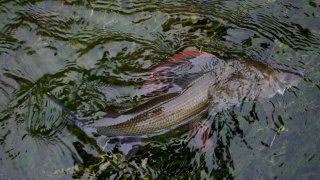 I established minimal size limit for grayling of 40 cm to support natural reproduction of fish in rivers. 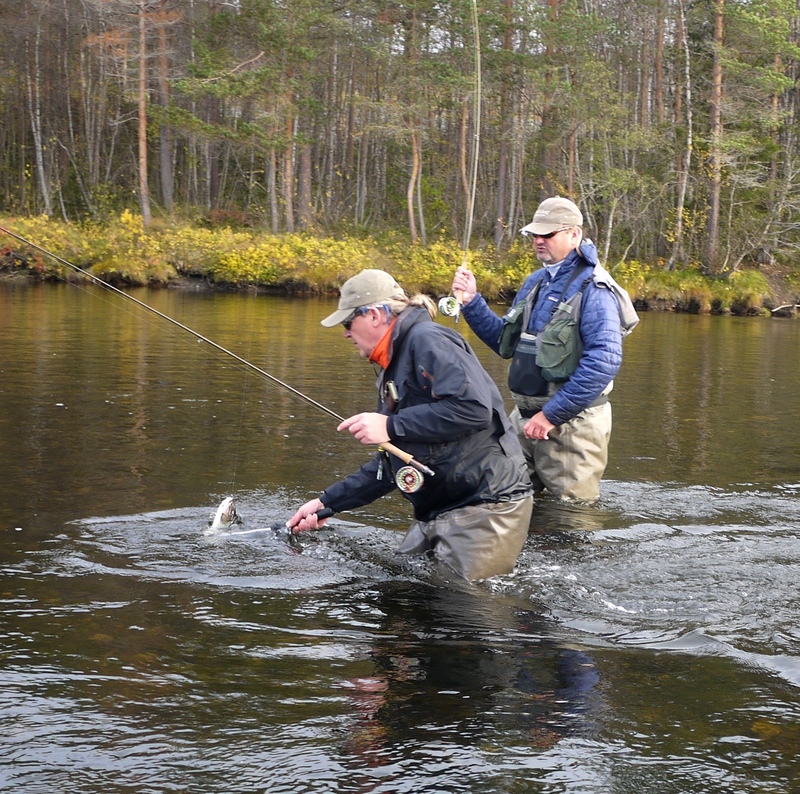 And it is absolutely without doubts, that this is the best method of management. 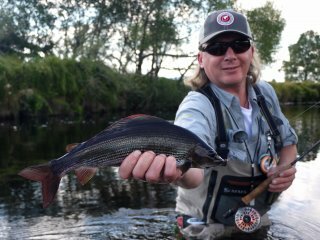 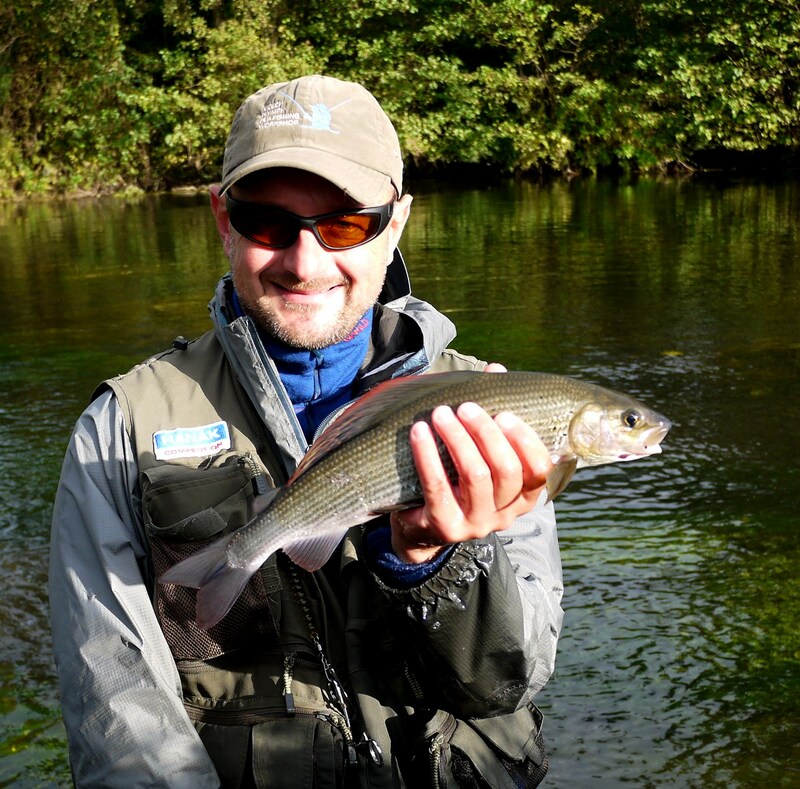 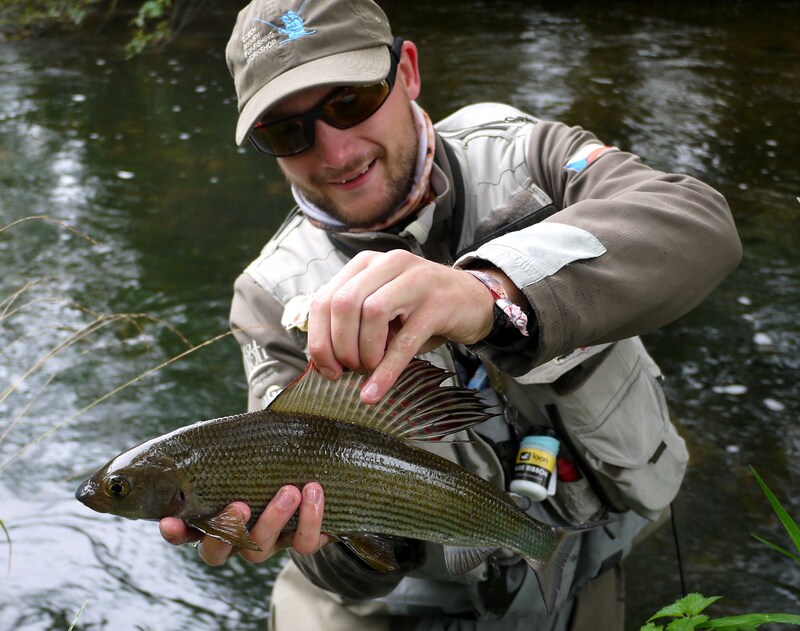 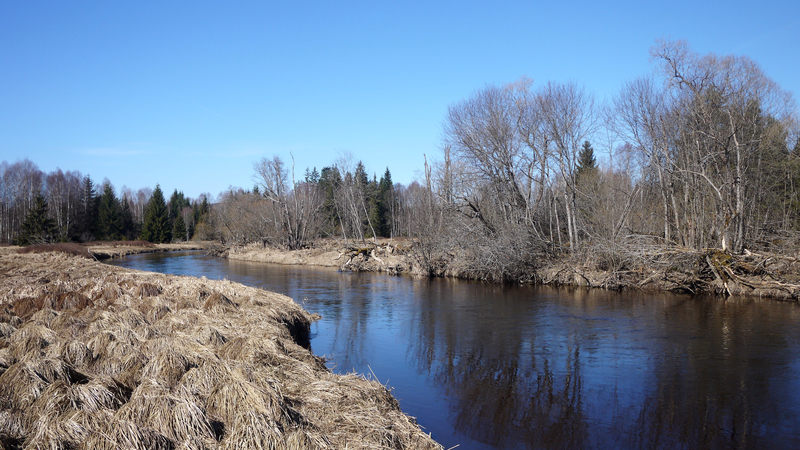 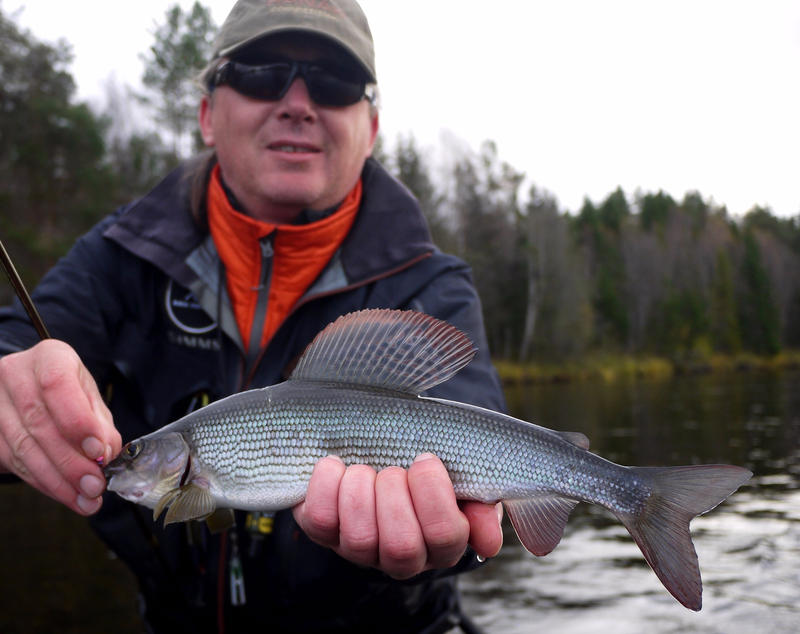 In rivers, where are conditions suitable for natural reproduction, the grayling population restored quickly, I don´t need some serious research to prove the results, I go fishing there . 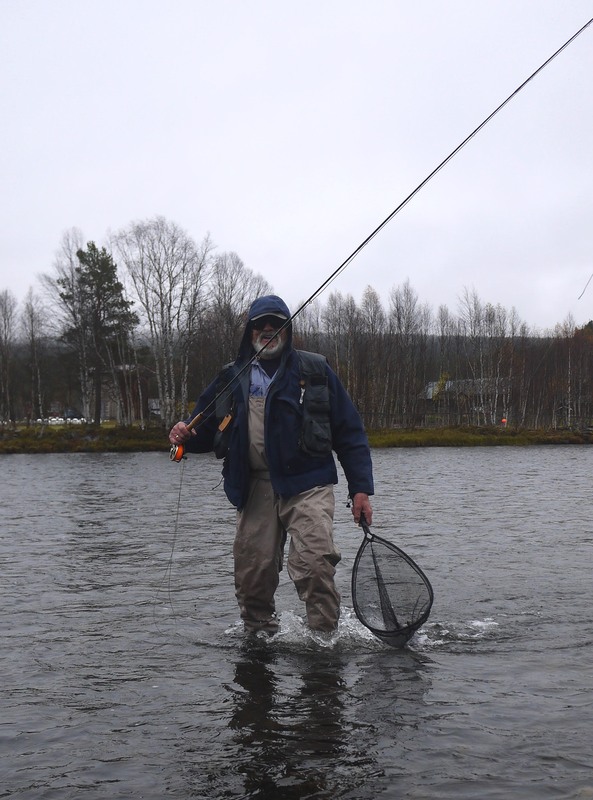 However, I organised also scientific project aimed on the dynamic of fish stock in the Warm Vltava above Lipno lake, if I find a time, I would make an article about it. 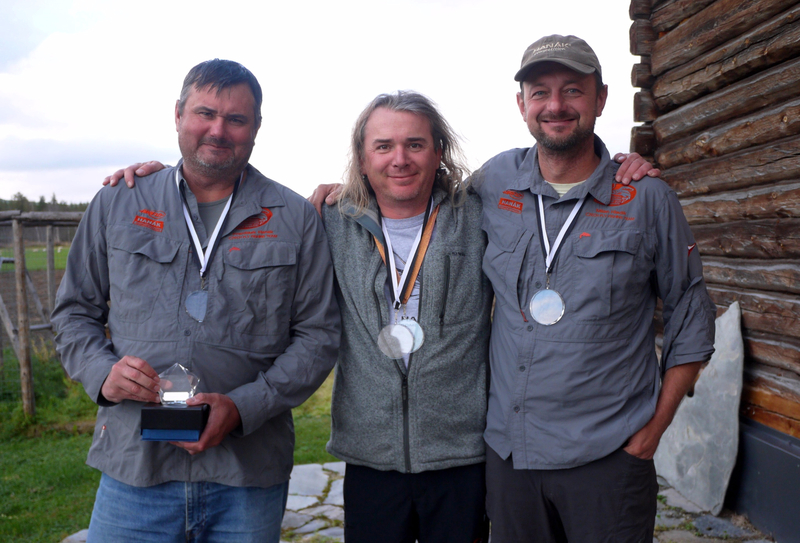 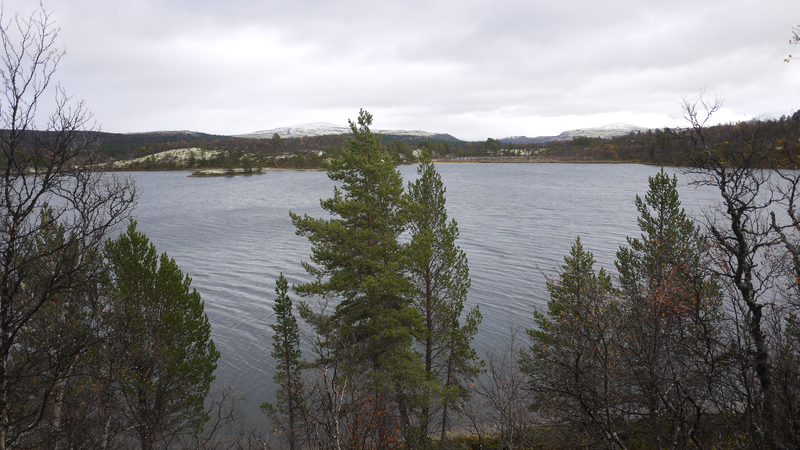 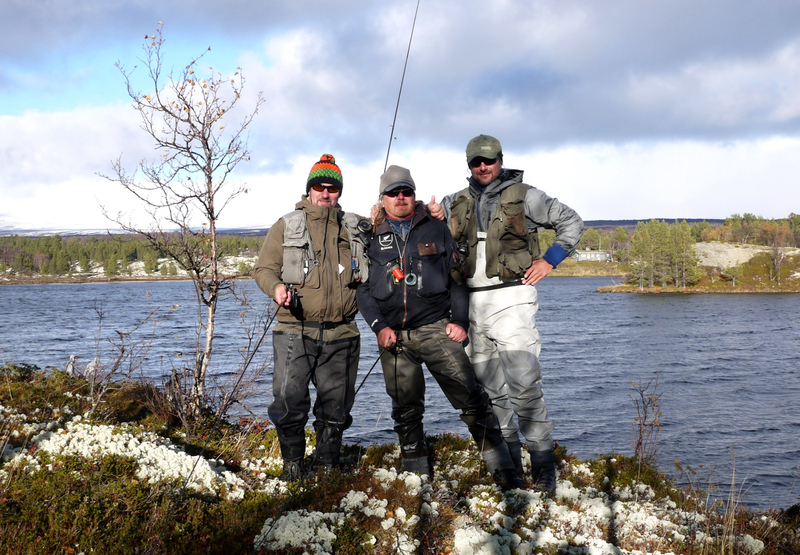 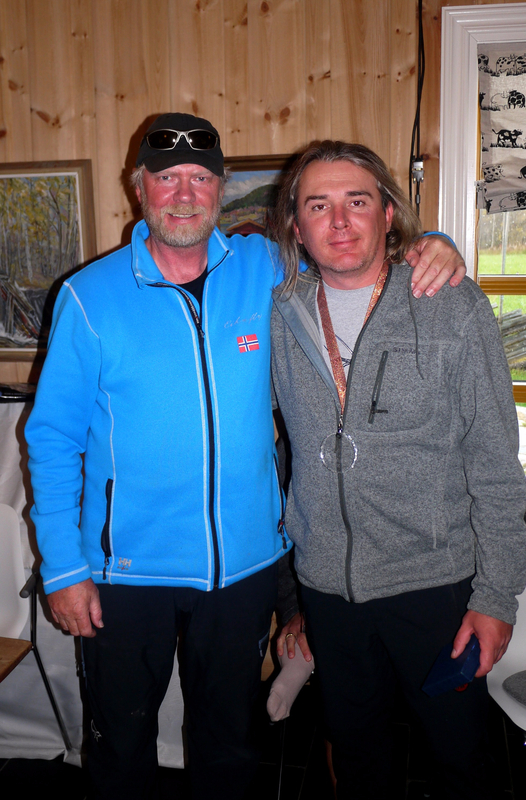 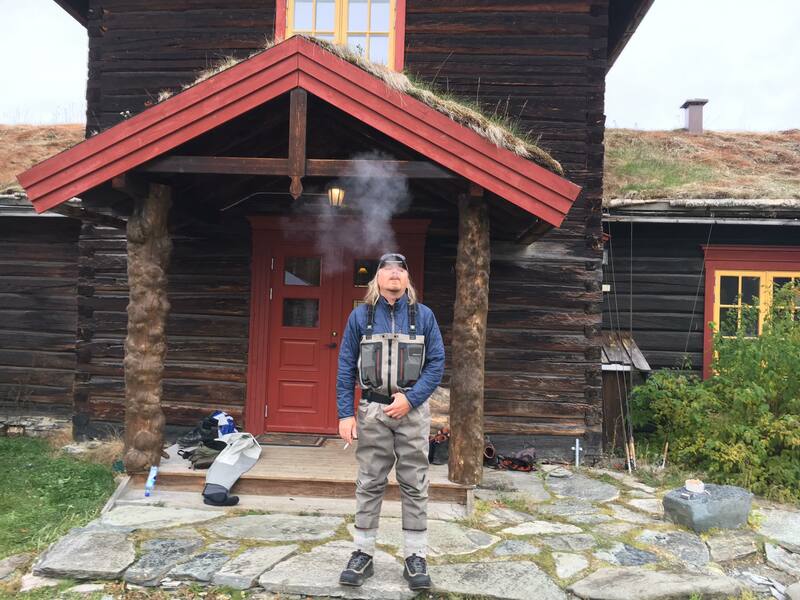 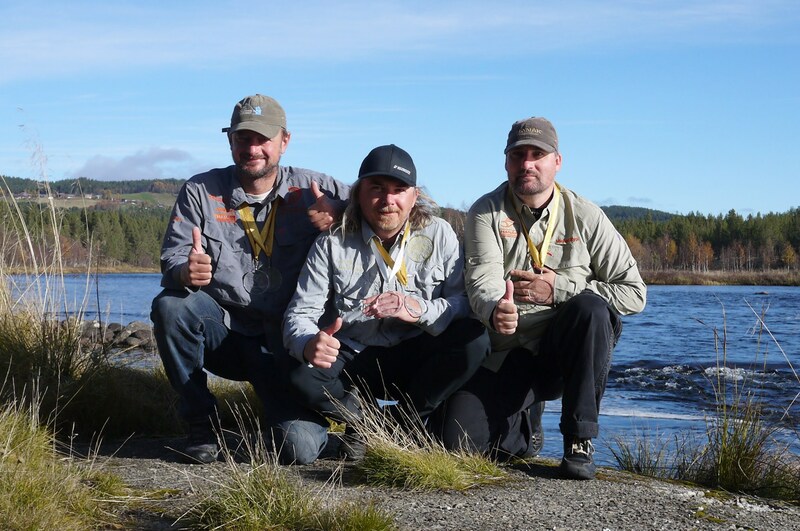 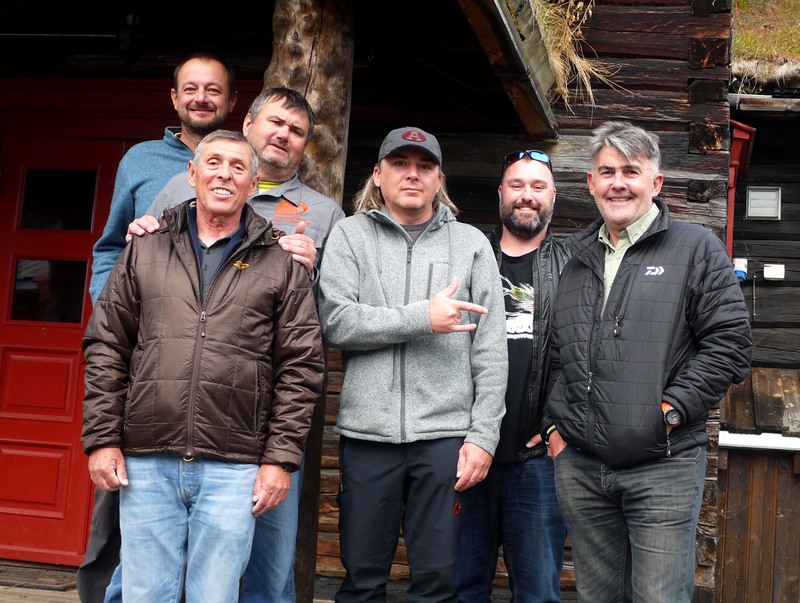 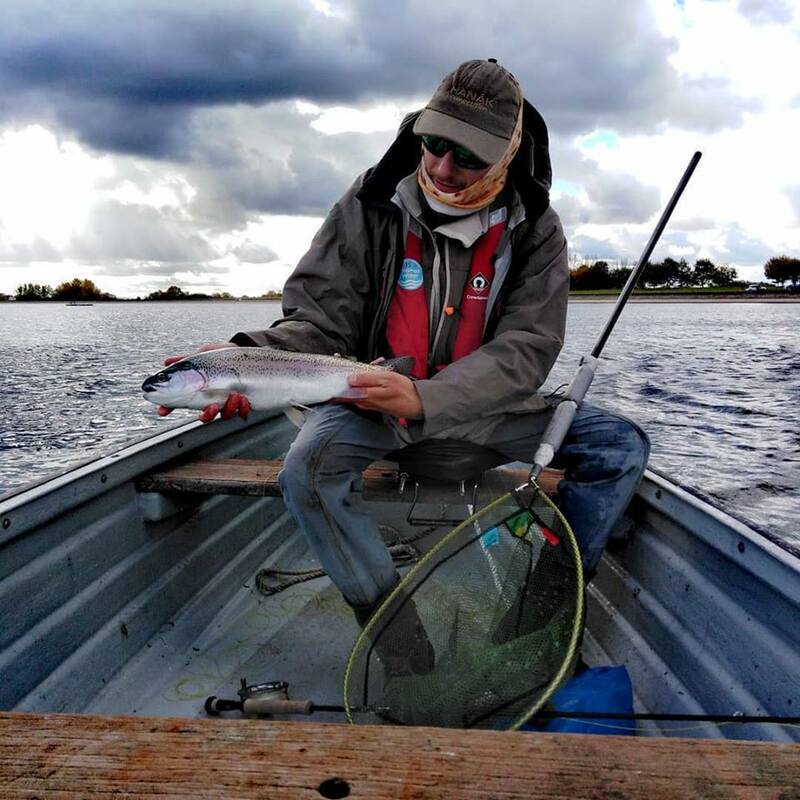 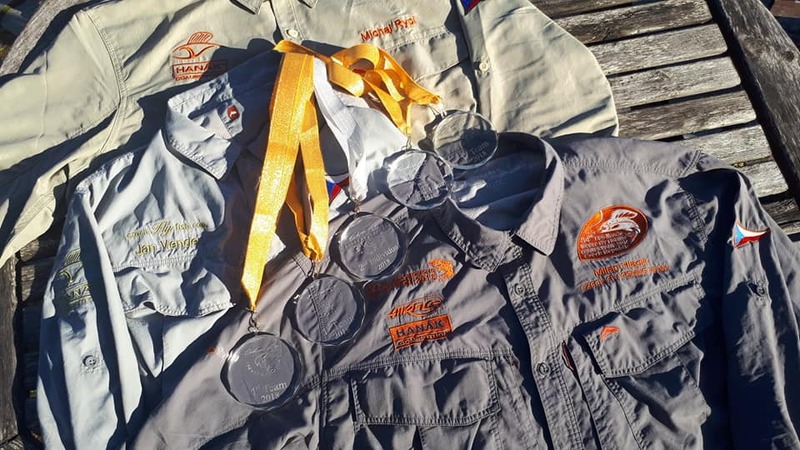 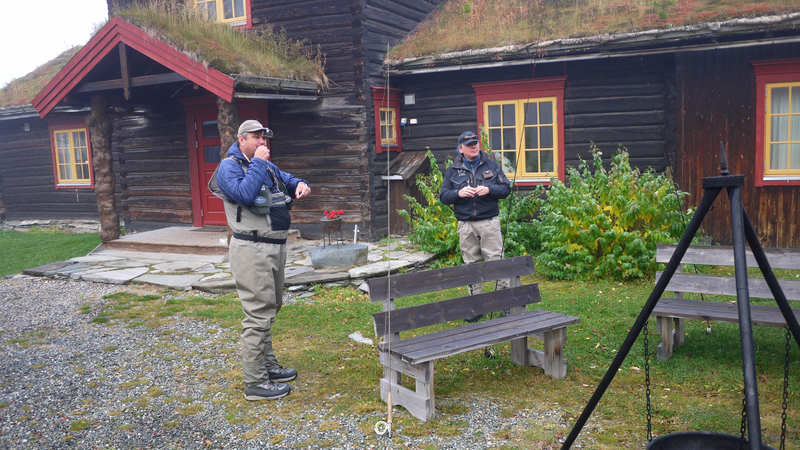 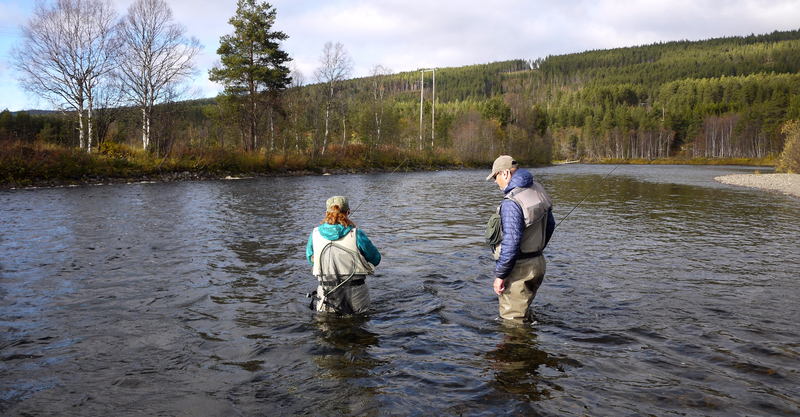 But I can write few articles about my personal “scientific” surveys with fly fishing rod in hand during last autumn, I´m going to start from the latest visits. 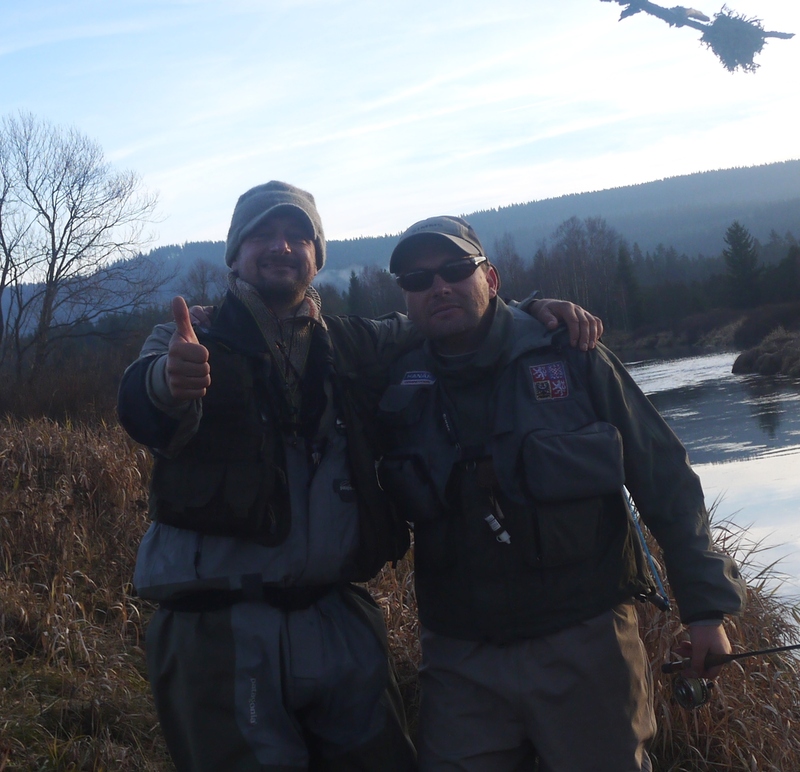 One sunny November day, I was there with Jiří. 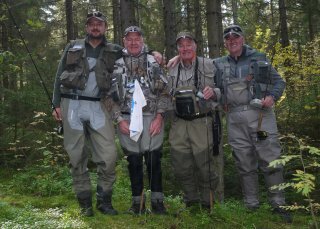 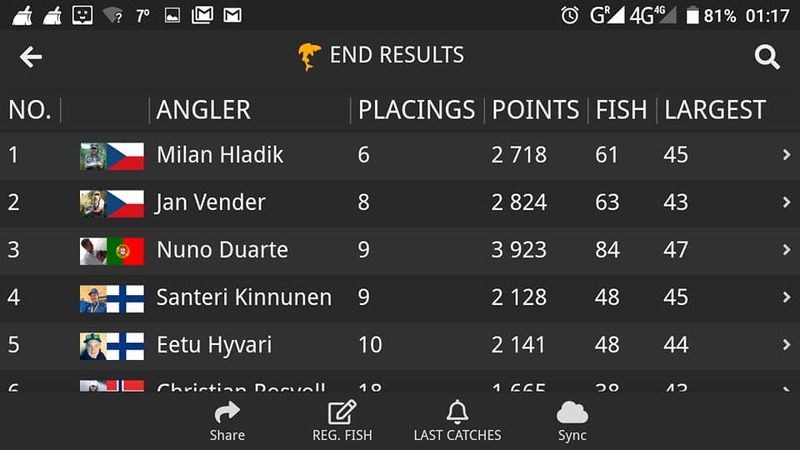 We were walking trough the meadows and “ananas fields”, it was really exhausting, but fishing was worth to withstand it. 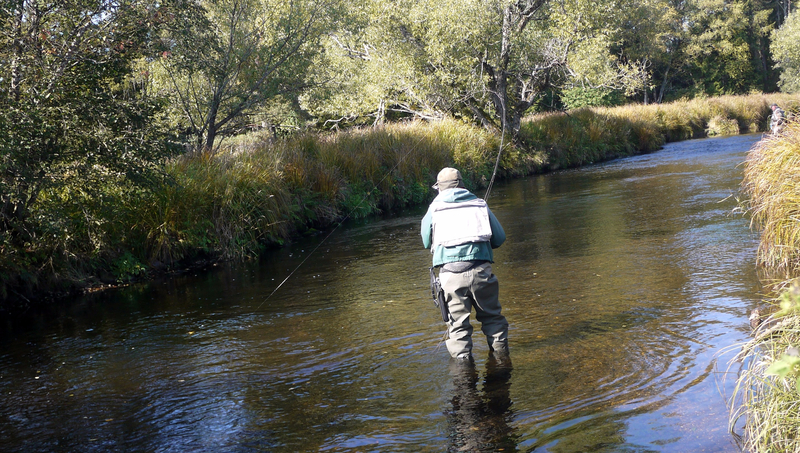 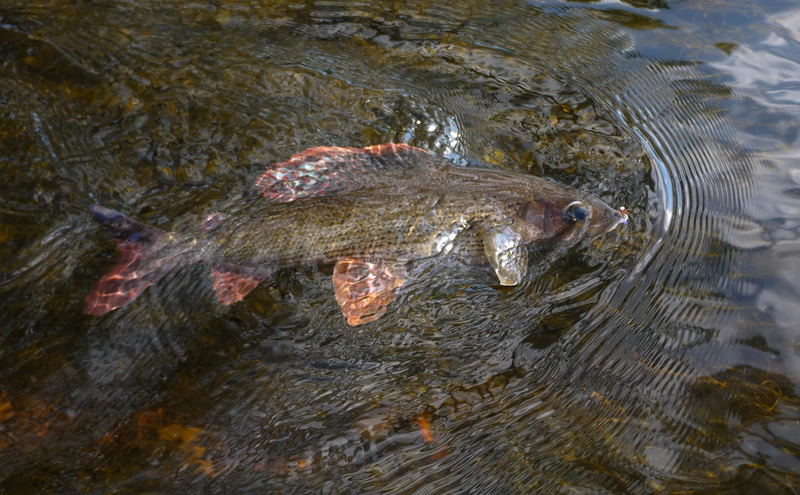 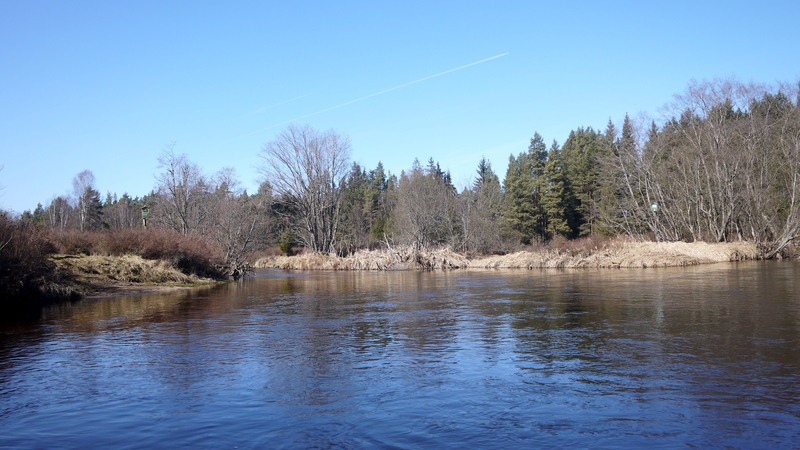 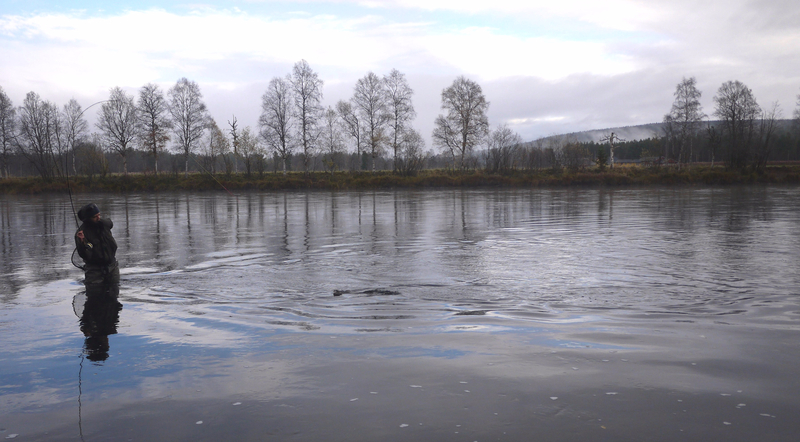 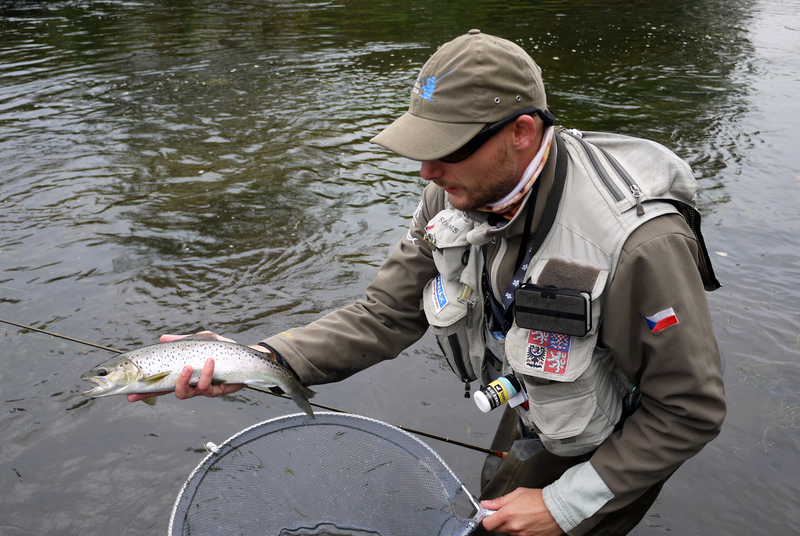 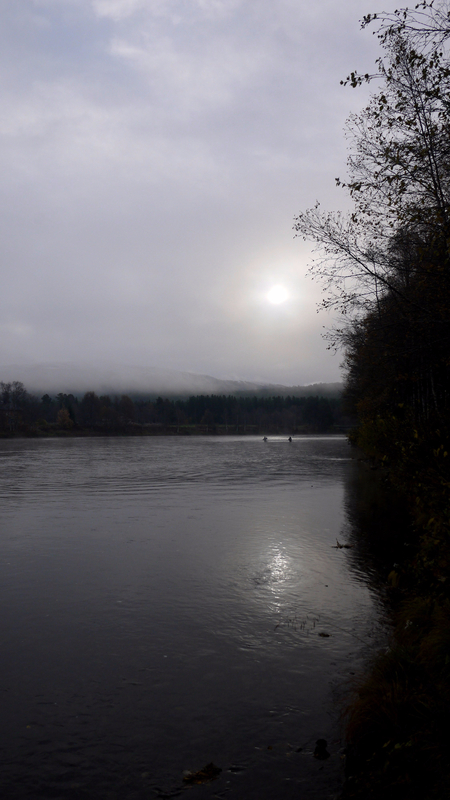 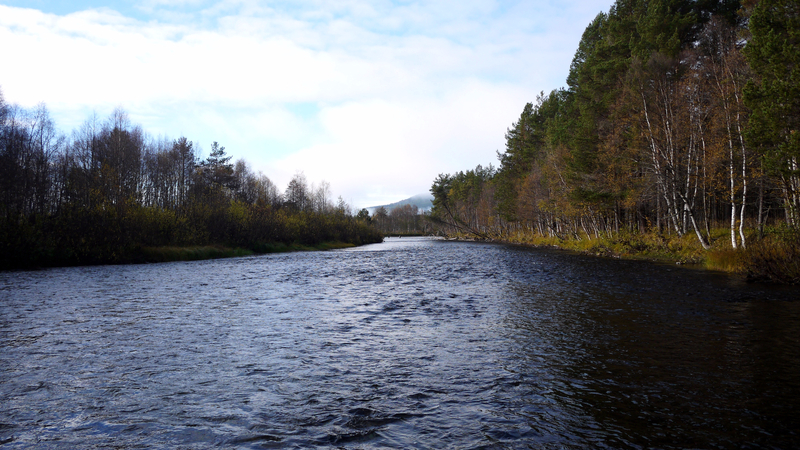 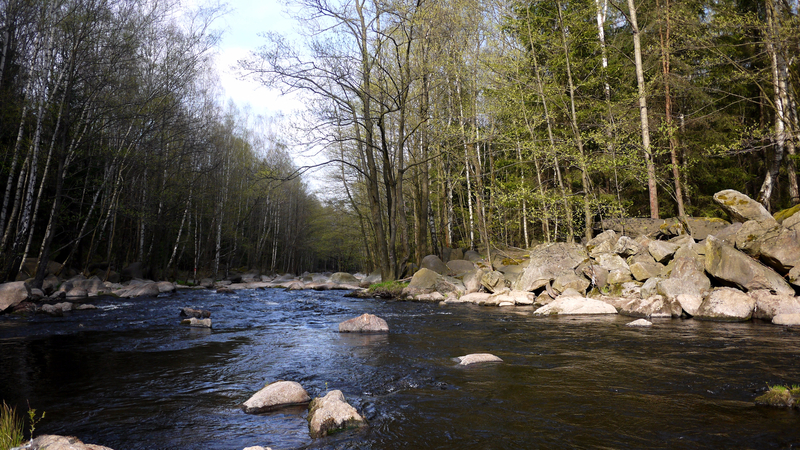 When we arrived to river, I saw few rising fish, Jiří decided to fish dry fly whole day and disappeared downstream. 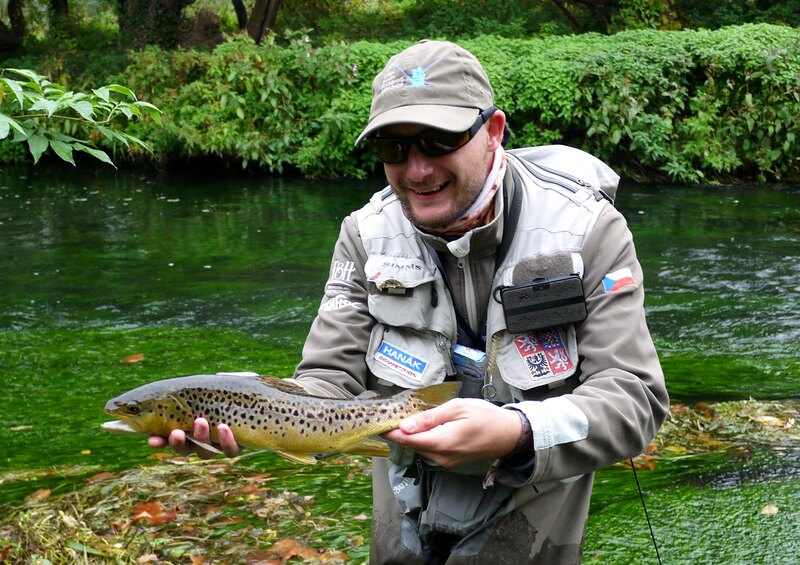 After few cats with dry fly I recognised that it is not the right recipe. So I tried few casts with squirmy worm, again without any effect. 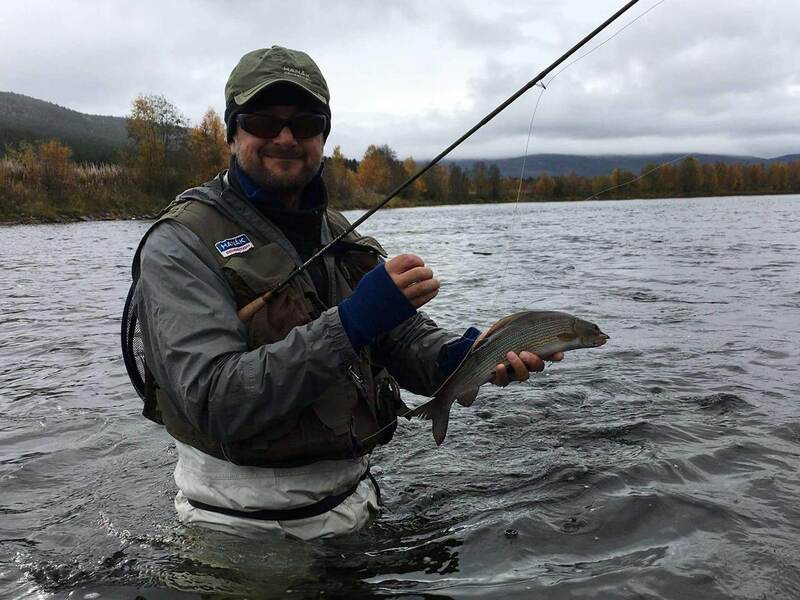 So I finally moved to nymphing with small nymphs size 16 with pink, golden or orange beads and fish started to cooperate. 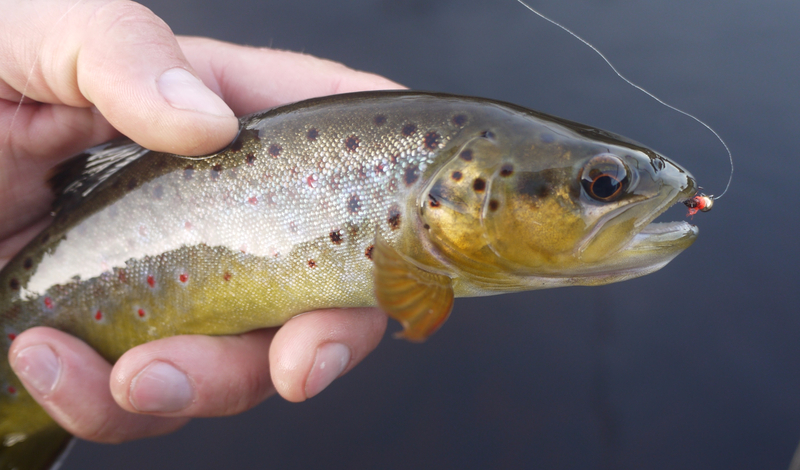 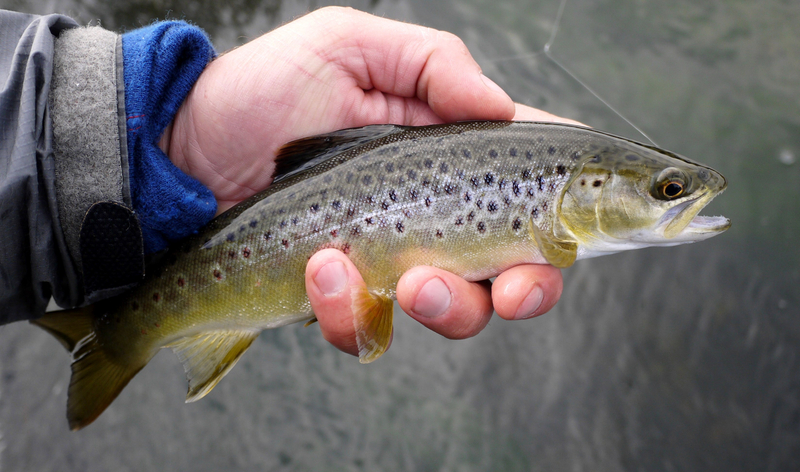 I caught 14 fish, three browns, four graylings of size +-38 cm and the rest were smaller graylings of about 30 cm. 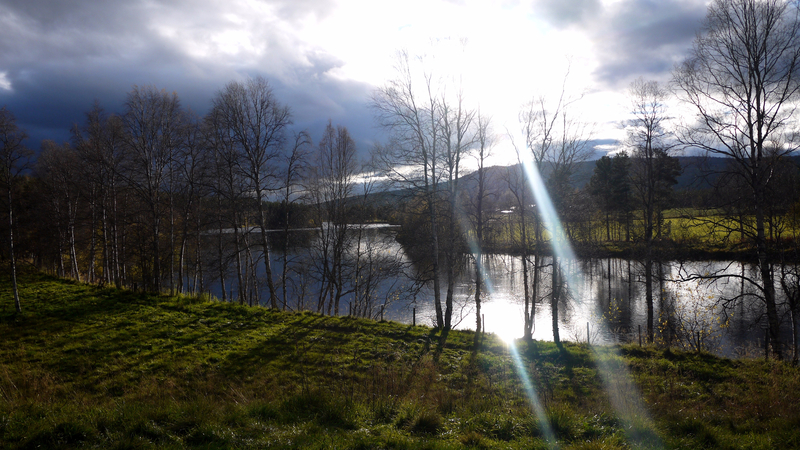 What a nice day. 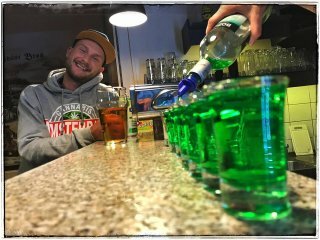 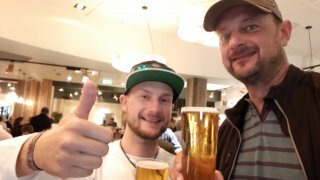 In October, I visited graylings few times with Honza and GoPro camera, I´m going to learn how to edit movies this weekend.